I feel that I have neglected a couple of European countries, and I wish to remedy that. 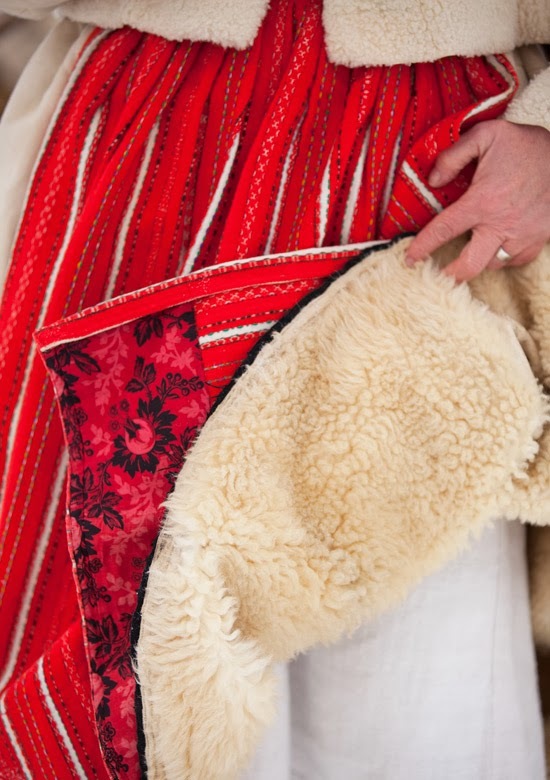 Today I will take a deeper look at one of the costumes of Sweden which has a distinctive embroidery tradition. 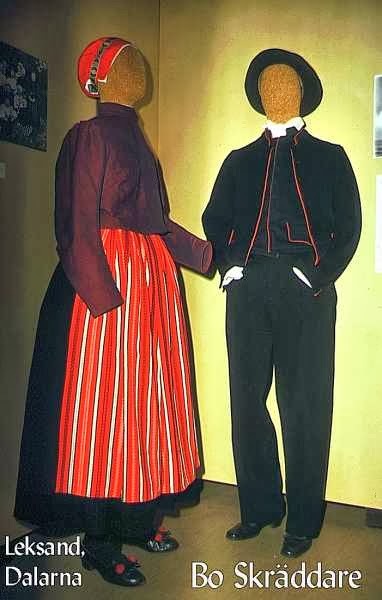 Embroidery is not as common in Swedish folk costume as it is in some other countries, like Norway for example, but it does occur in some localities. 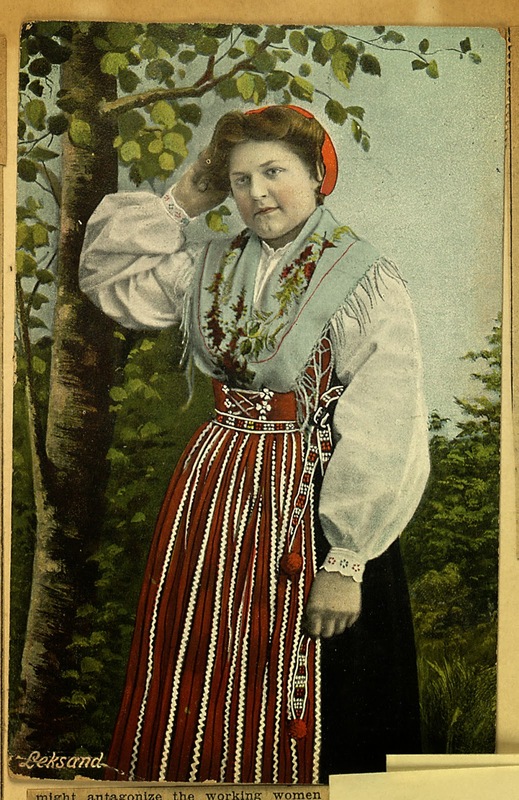 Swedish costume in general is more linked to decorative weavings and printed cloth. 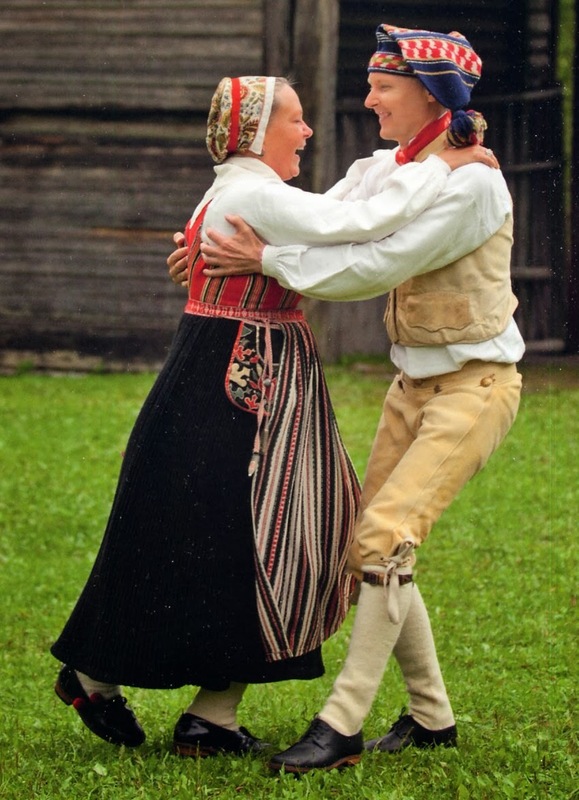 Dalarna, in Latin Dalecarlia, is a center of Swedish folklore. 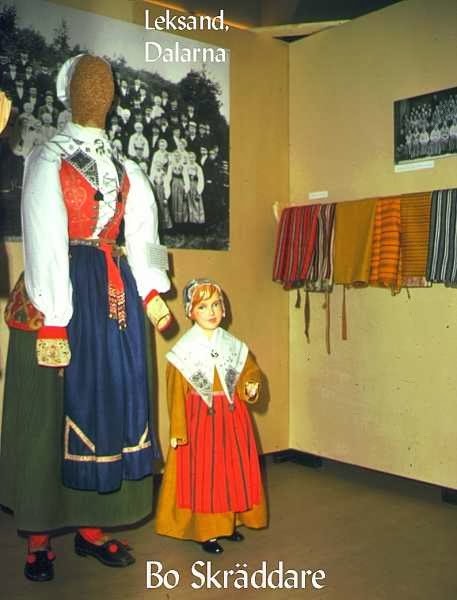 It is one of the places where folk costumes survived the longest, And indeed in some parishes are still used in an unbroken tradition. Each parish had its own costume, some of which had fallen into disuse, but have now been revived. 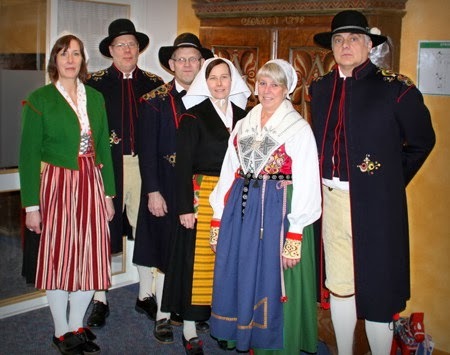 In contrast to regions where the local costume had to be reconstructed, and which have only one or two recognized variants, in places such as Leksand where it is a living tradition, there are many variations. 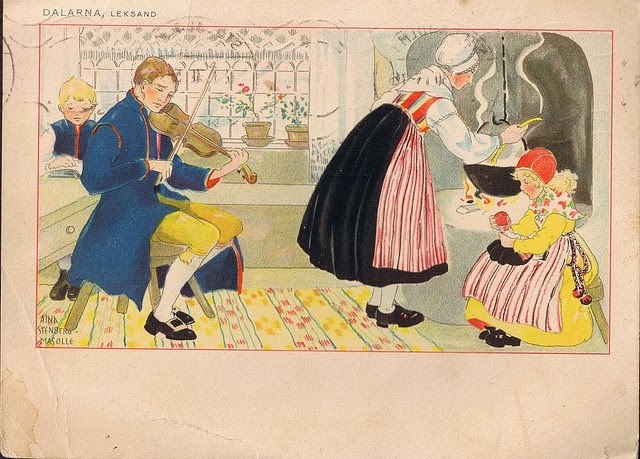 In Leksand, these oral traditions were codified and written down in 1923. These specified, for example, which of nine apron colors was to be worn for which Church holiday or season [in Church]. 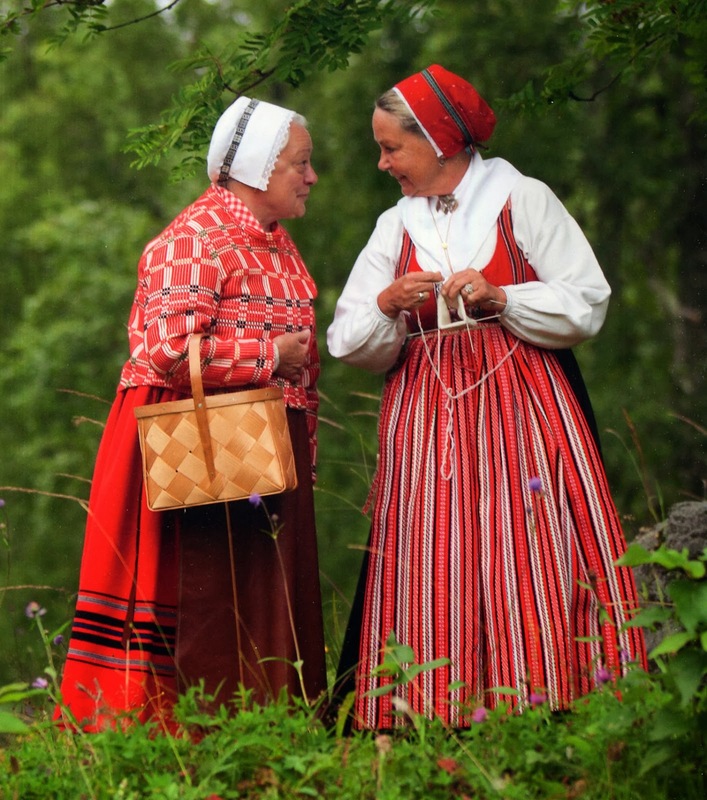 Dalarna has also preserved some very old distinctive dialects, many of which are not mutually intelligible with Swedish, and thus may be considered to be a different language. 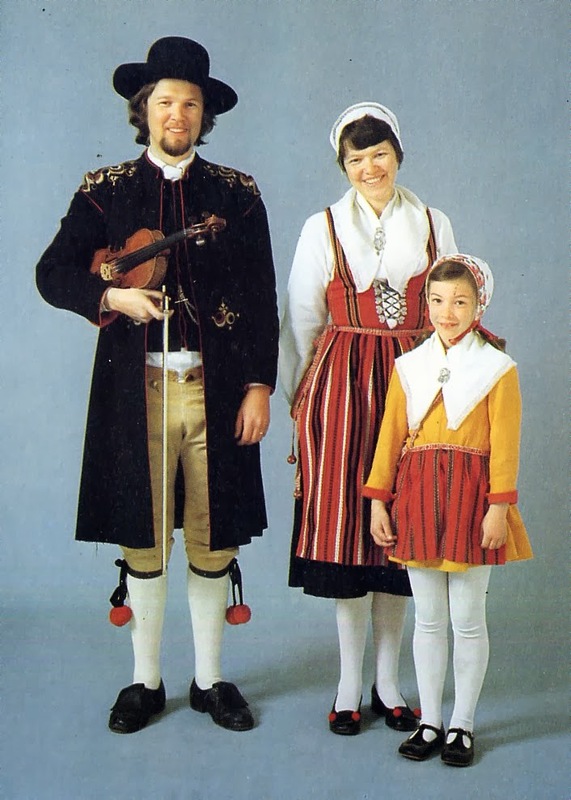 The family at the head of the article are wearing one version of the festive non-Church costume, considered appropriate for playing music and for dancing. The hems of both the mother and daughter are extemely short, reflecting the period of the 1960's and 70's. In general the hems have since come down again. 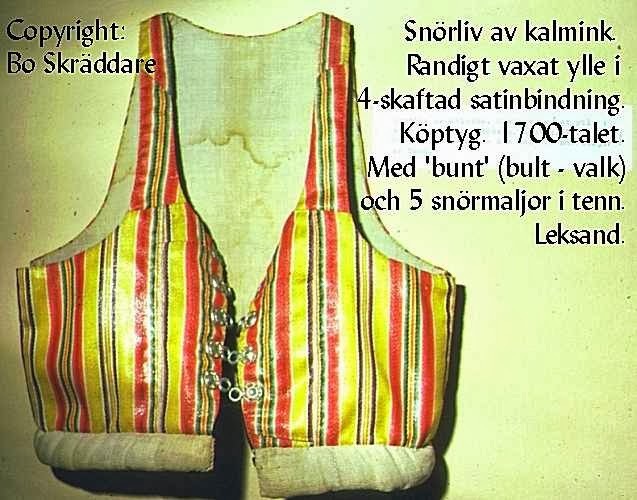 This costume is worn in the parish of Leksand and the neighboring parish of Siljansnäs. 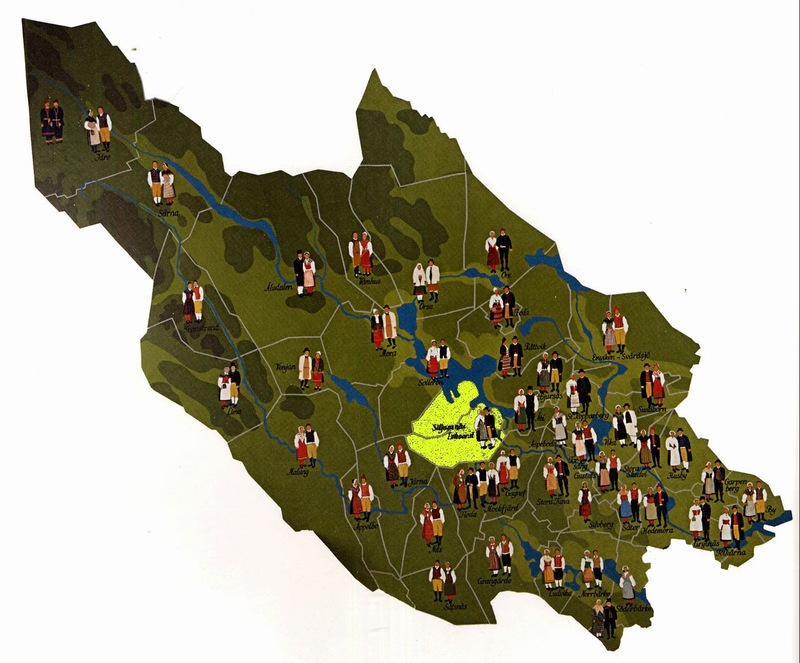 They are shown in yellow on this map, at the heart of Dalarna on lake Siljan. 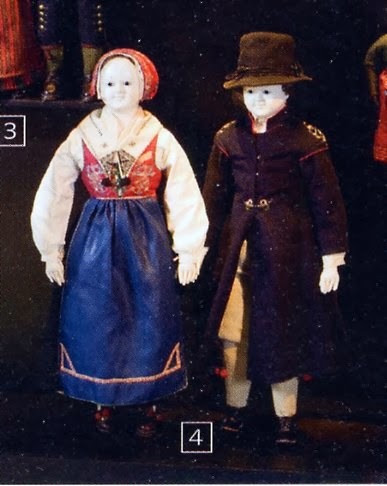 There are several variants of this costume, many of which are only seen in church. I will only describe a few, as I have limited space, and I have little information about the church costumes. 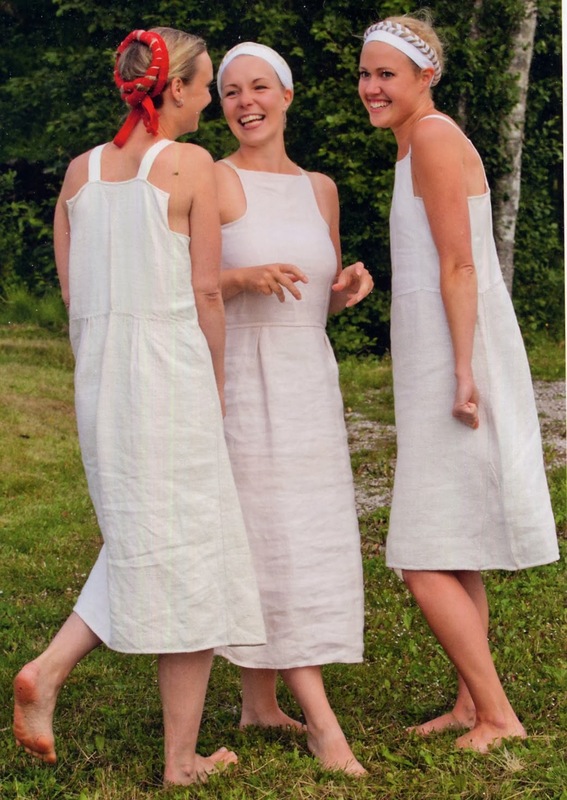 The foundation garment for women is a linen chemise, särk. 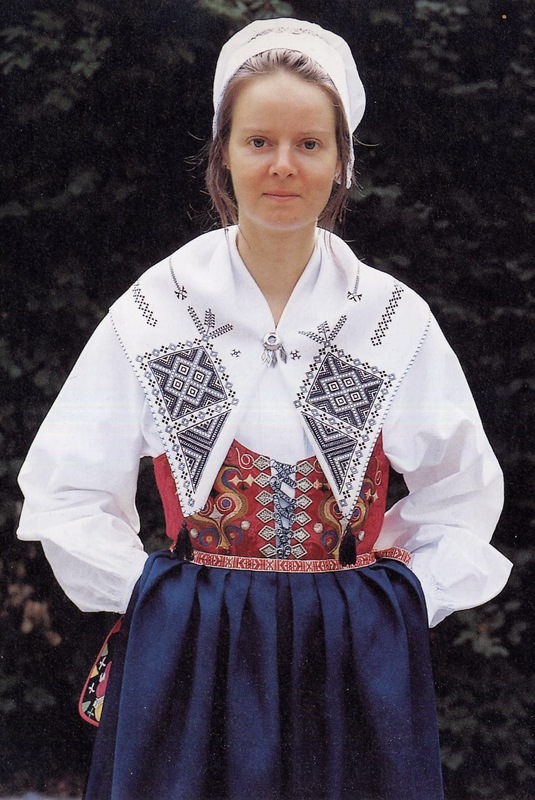 In Leksand the chemise is sleeveless and has straps over the shoulder. It is a couple of inches shorter than the skirts. 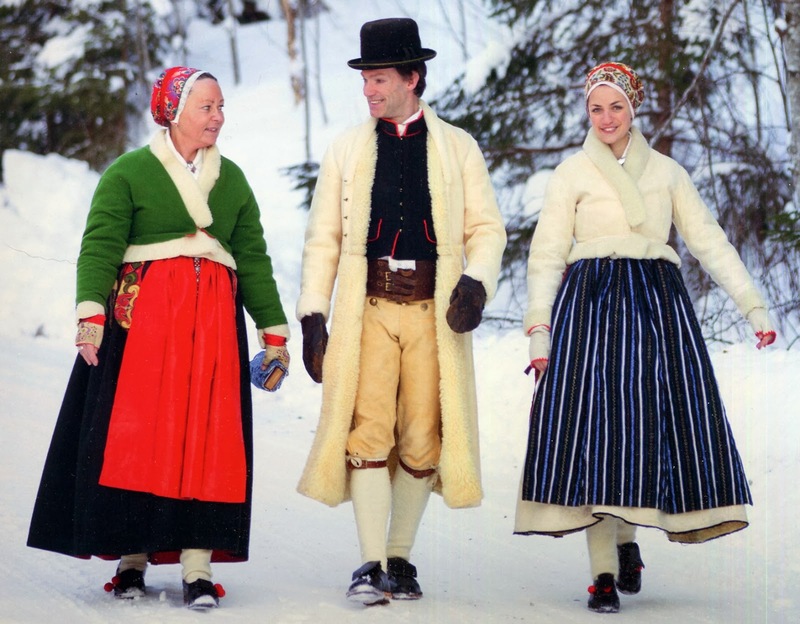 The woman on the left in this first image is from Leksand. 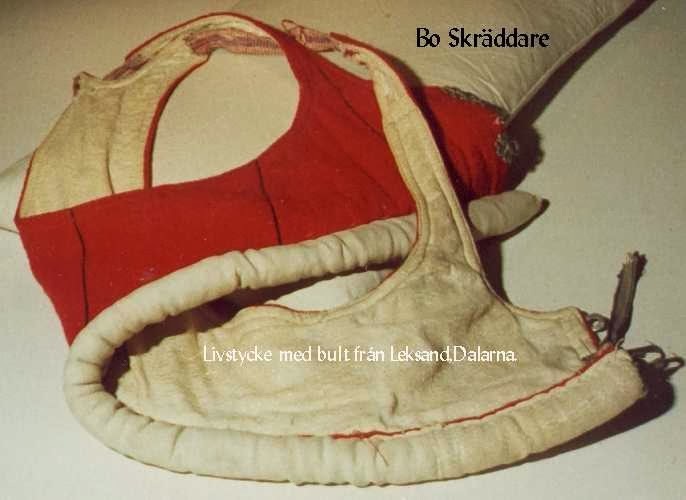 In Leksand, both married women and unmarried girls divided their hair in two parts, each part is wrapped in red wool ribbon, and then pinned around the back of the head as a foundation for the headpieces. 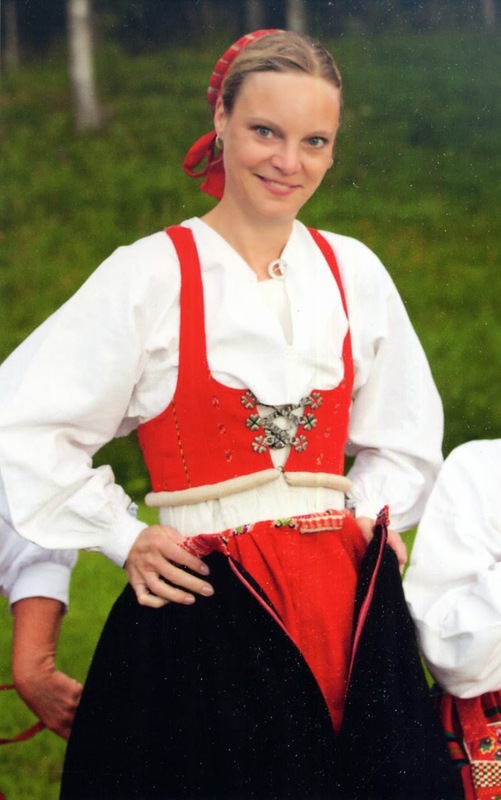 The shirt, överdel, is collarless, hangs to just about the waist and has sleeves set in at a right angle. The sleeves are smocked into wristbands. These are embroidered in more festive garments, and are closed with a ribbon. The neck opening is closed with a ring brooch. 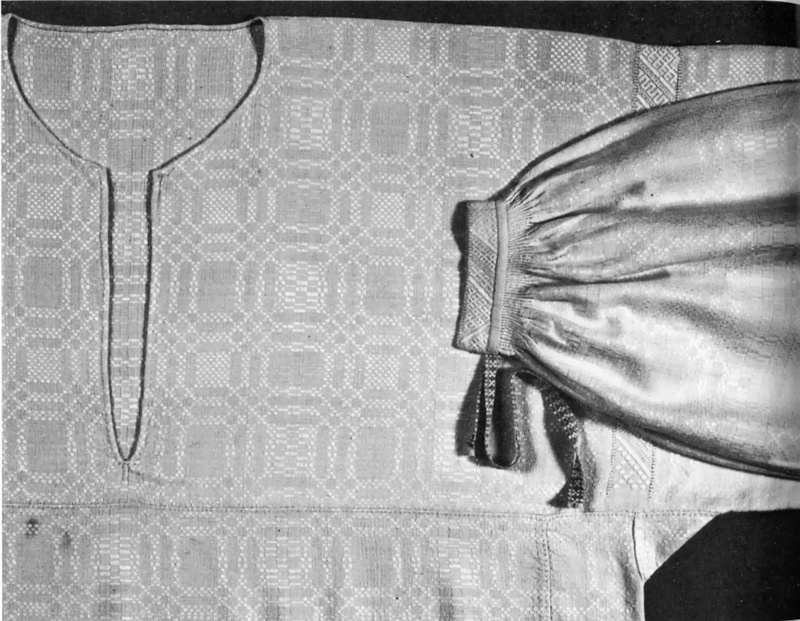 There may be a band of embroidered linen set in between the body of the shirt and the sleeves, and the entire shirt may be of a fancy weave, as in this example. This would be a very formal shirt. 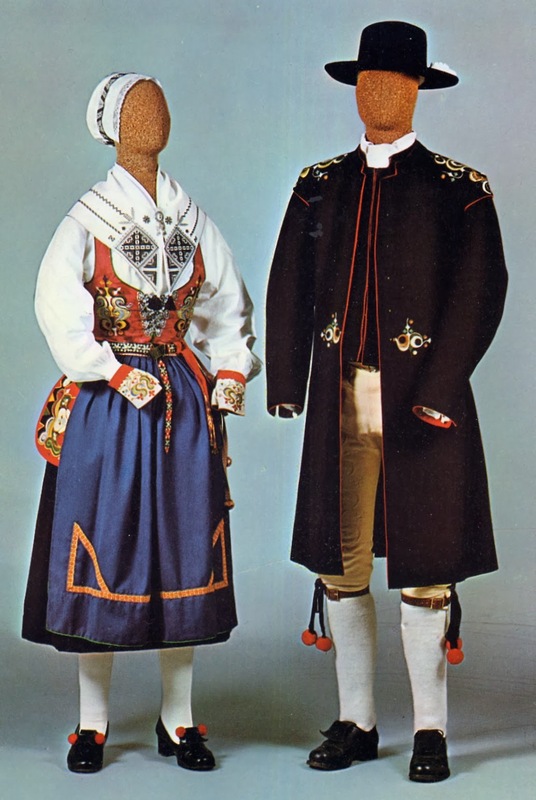 This fine, counted thread satin stitch embroidery is one of the 4 types used in the leksand costume. 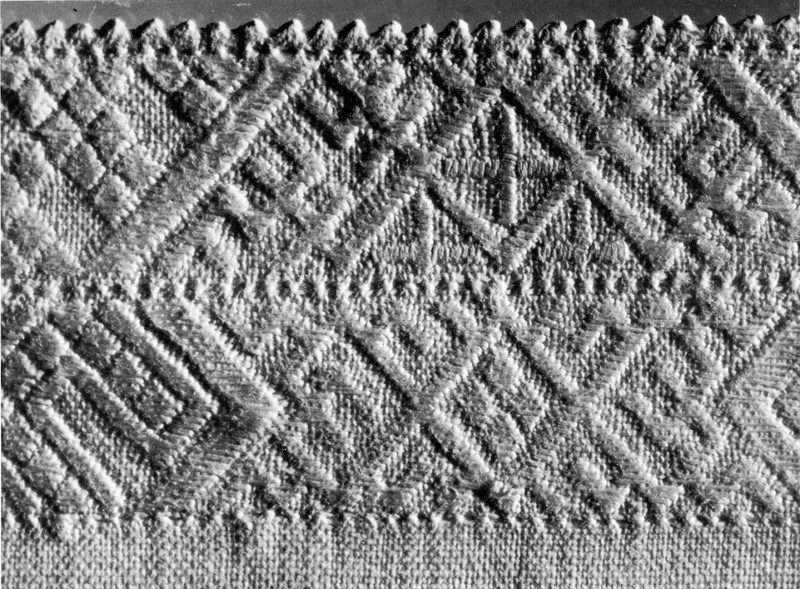 The motifs used are geometrical, and based on diagonal lines, being of the same type of design as is found in inkle weave sashes. This allows for a great variety of designs. The edge of the cuff is finishes with nuggor. 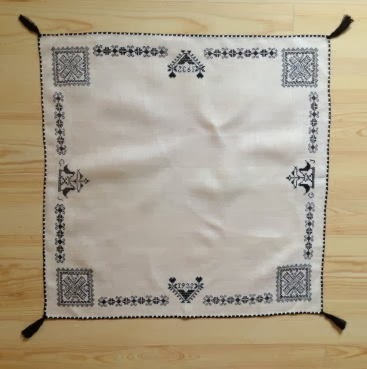 This is made by executing a row of hemstitching, then folding the cloth right along the middle of it. The gathered groups of thread thus form 'picots' along the edge. The edge is then sewn down with an overcast stitch in fine thread to secure it. This example is twice as wide as a usual woman's wristband. Perhaps it is a man's cuff or something else. 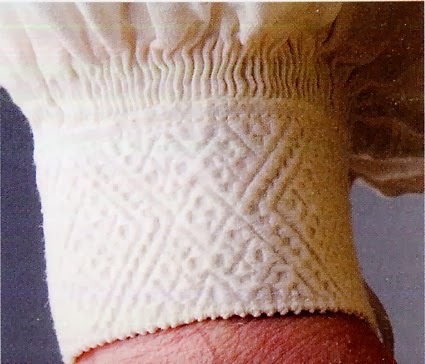 Men's cuffs had the same sort of embroidery. 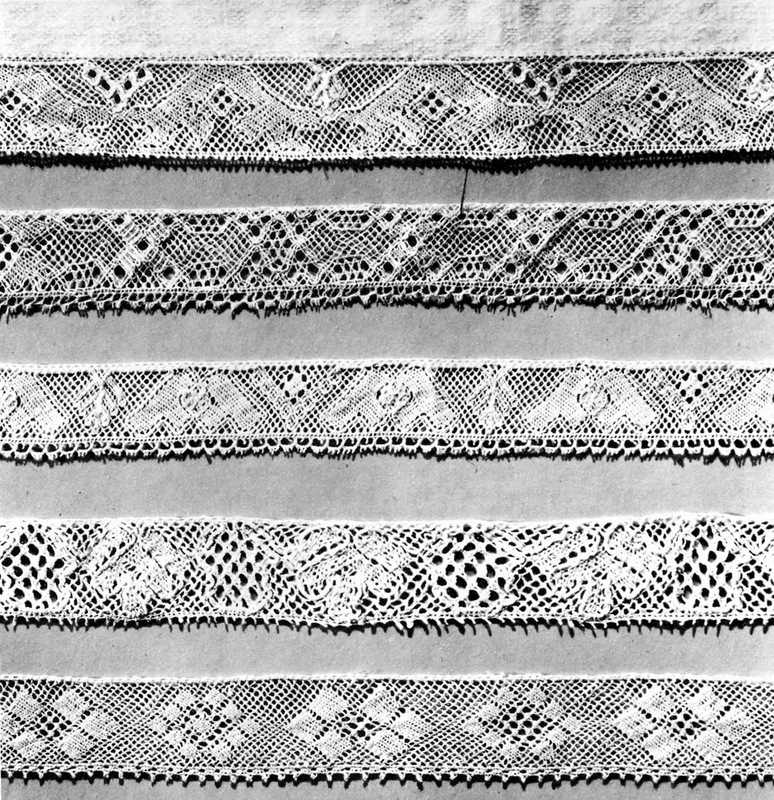 This type of embroidery was also used on handkerchiefs, as here, and likely other household linens. The designs used were variations on those shown. 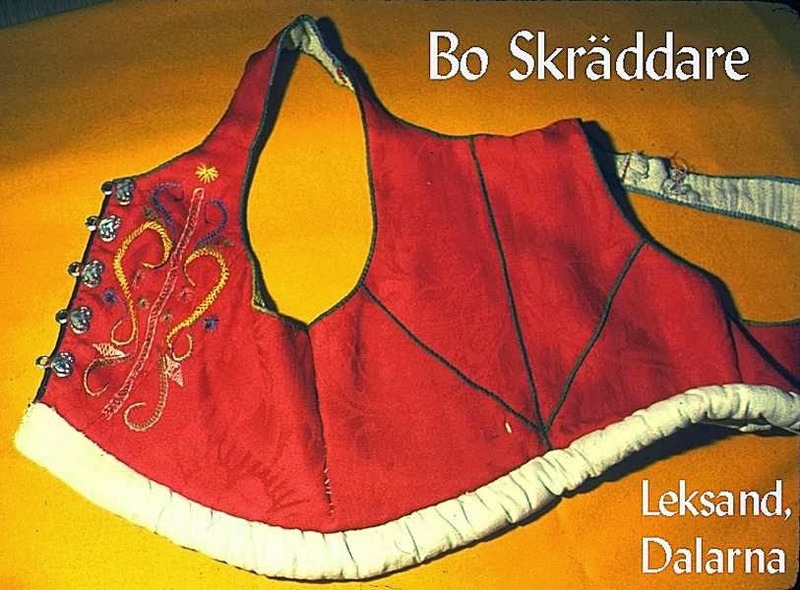 The bodice, livstycke, is separate from the skirt in the Leksand costume. I have been able to document four types. There may be more. They have a rounded front opening, usually rather low as worn today, just above the bust. 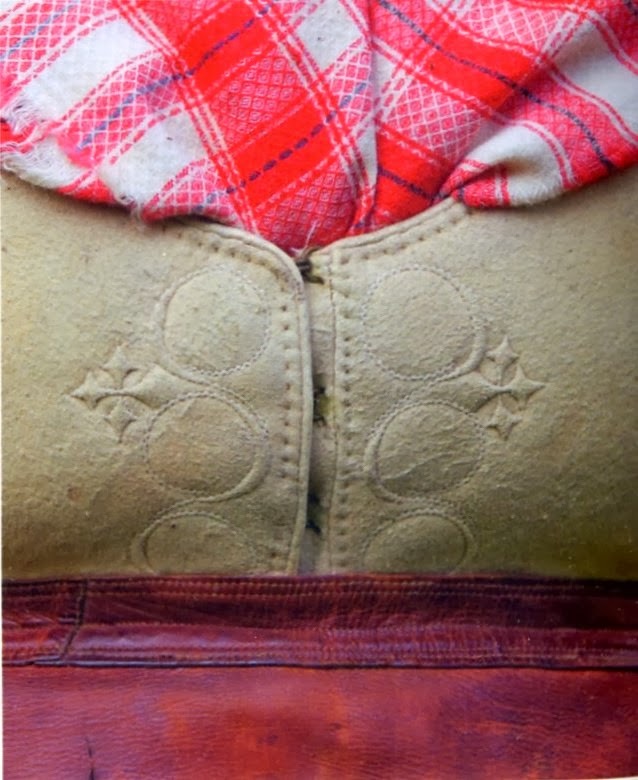 Most are laced closed on metal loops attached to the front opening, and all feature a padded roll at the bottom, designed to help hold the skirts in place. 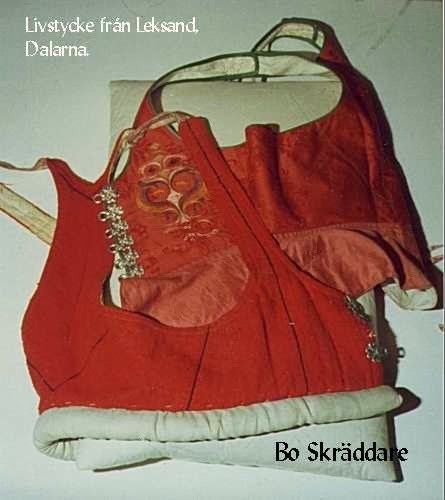 Here is an older bodice from the local museum. 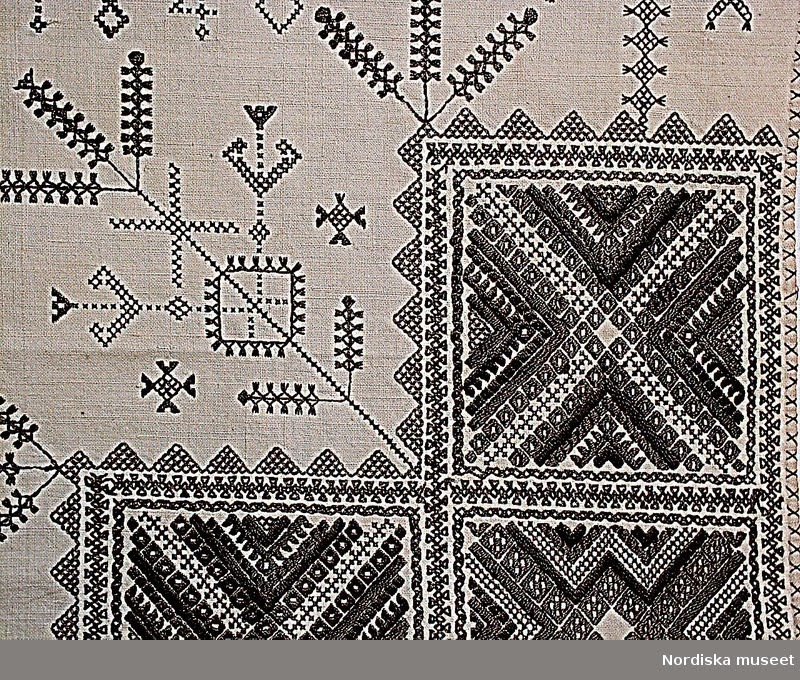 This one is made of a dark silk, and is embroidered with a simple design reminiscent of the head of a maypole. The neckline is rather high. 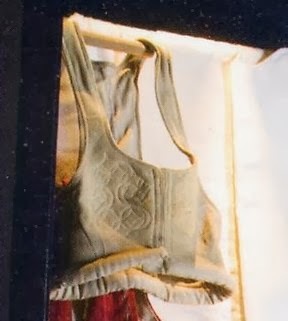 This garment is also found in living tradition. Here are some images of a woman in mourning attire on her way to a funeral, so she is wearing this dark bodice, and the yellow apron. You can see that it is made of black silk damask. Here is another piece from the local museum. This is of an everyday work bodice, much worn and patched. It closes with buttons because they are much cheaper. It also has a higher neckline than the dress bodices, which is only practical. 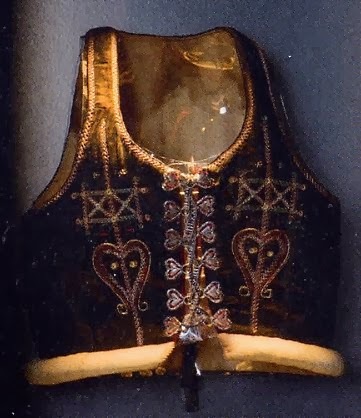 Sometimes in colder weather, bodices made from leather are worn. These are made with the same kind of chamois leather as is used for the men's breeches. 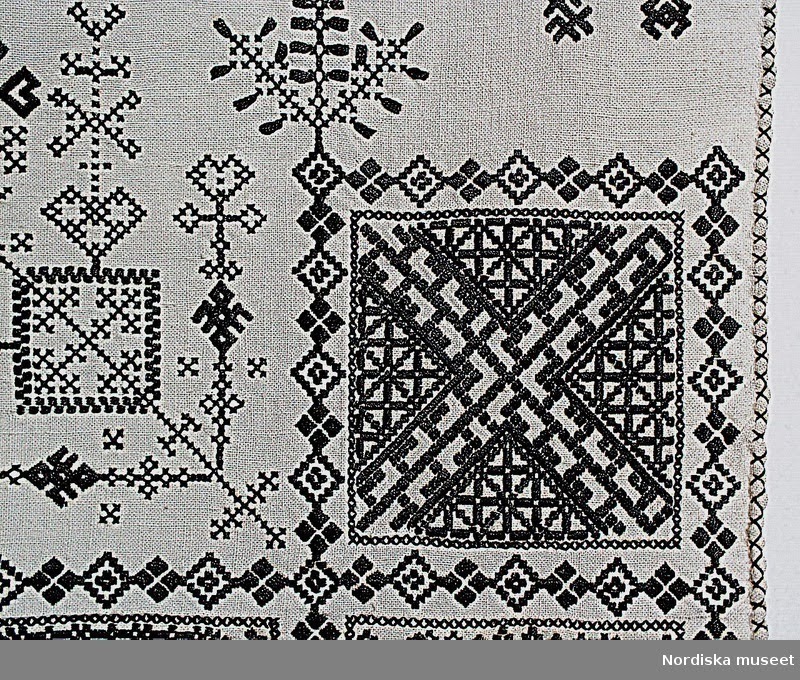 They are also sometimes embroidered in the same way, in which case they are called laskat. They hook closed so as to be warmer. 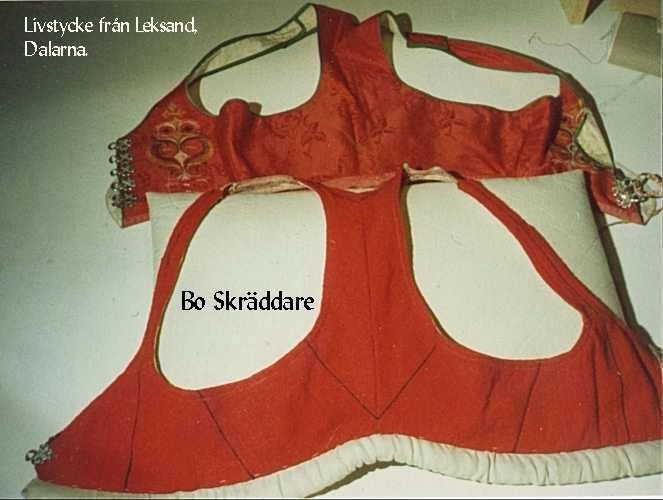 The best known bodices are the red ones, which come in two forms, the sunday and festive bodice, which is red with woven in stripes as in the photo at the head of the article, and the ceremonial, or wedding guest bodice, which is of red damask and may be embroidered in the unique Leksand style. 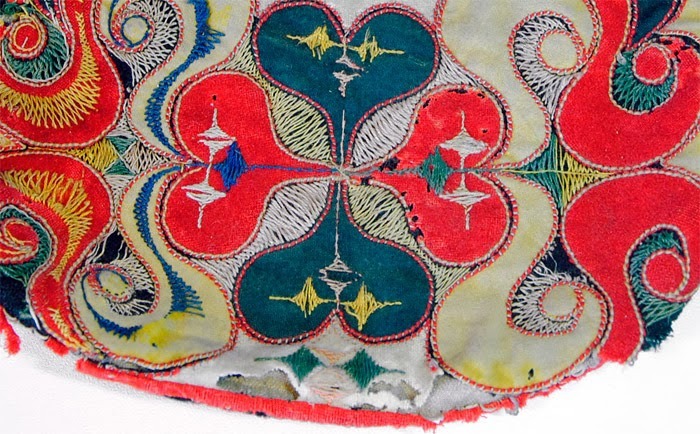 This embroidery which is found on the women's bodices is also found on the pockets, and on the men's jackets. This style seems to be unique to Leksand. 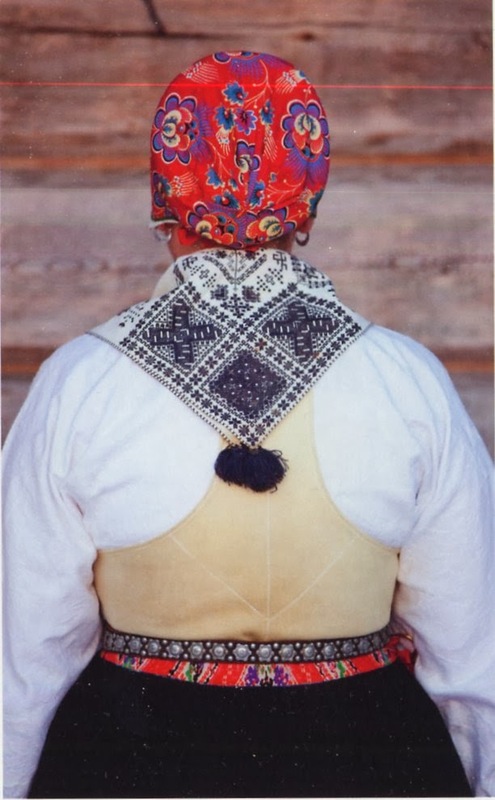 Older women sometimes make the ceremonial bodice with embroidery from a darker colored cloth. 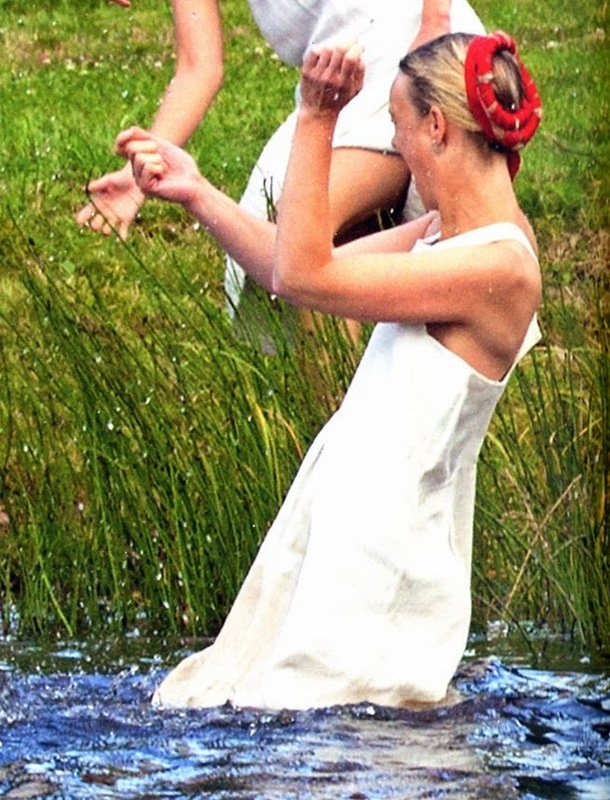 A mixed linen-wool underskirt is worn over the chemise and bodice. This is called randil, and for everyday wear is the only skirt worn. It is usually red and has horizontal woven-in stripes. 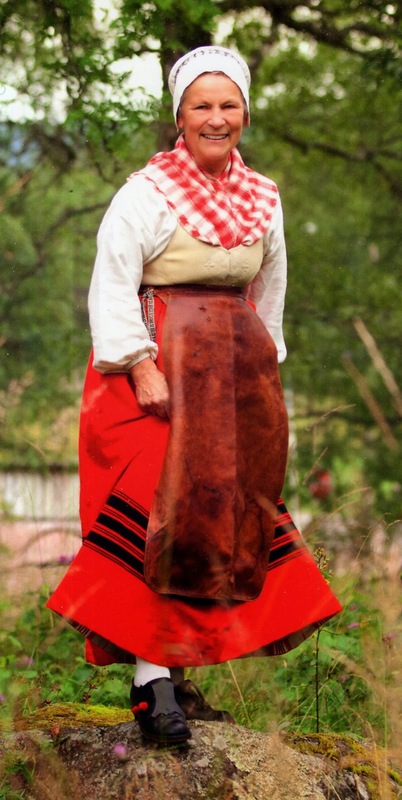 For daily wear the randil is worn with a skimp, a leather apron. 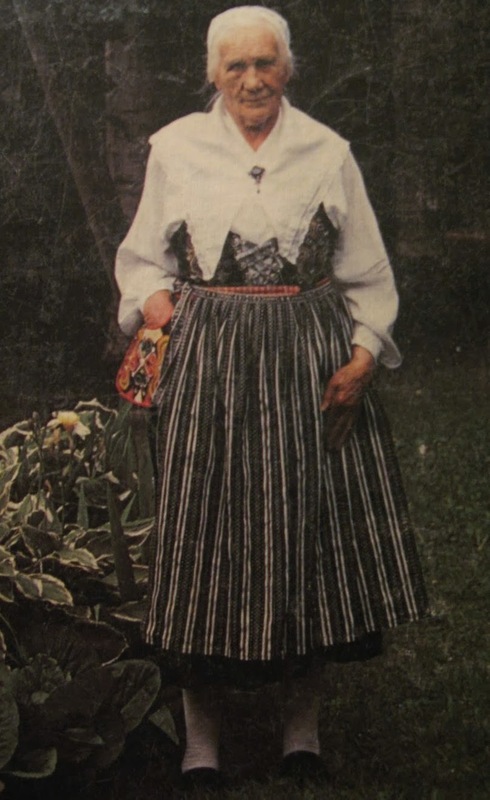 For the Sunday, Festive and Ceremonial costumes, a full black wool skirt skjorte is worn over the randil. 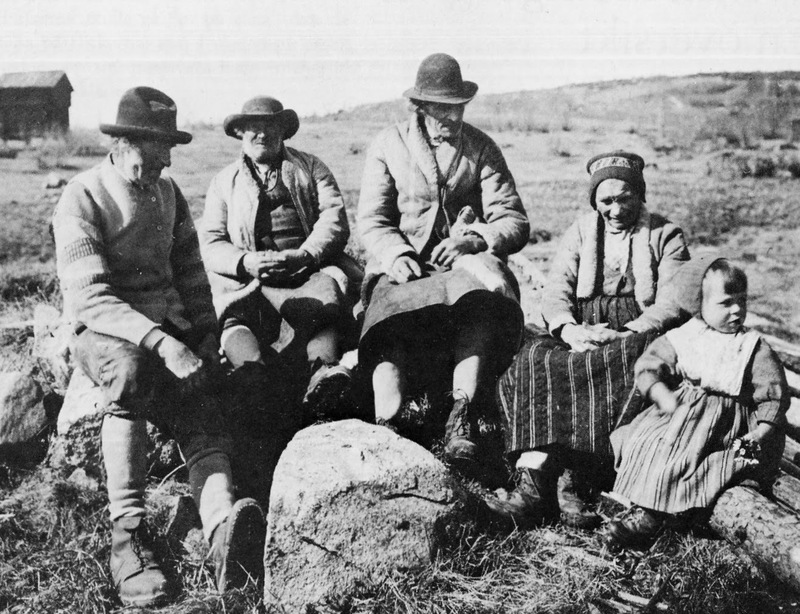 One more type of skirt is worn in winter which is made of sheepskin. This also may be worn under the Sunday black skirt if needed for warmth. 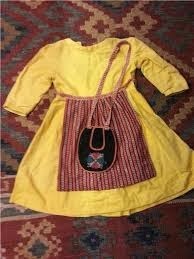 and the yellow and black woven apron for funerals and personal mourning. 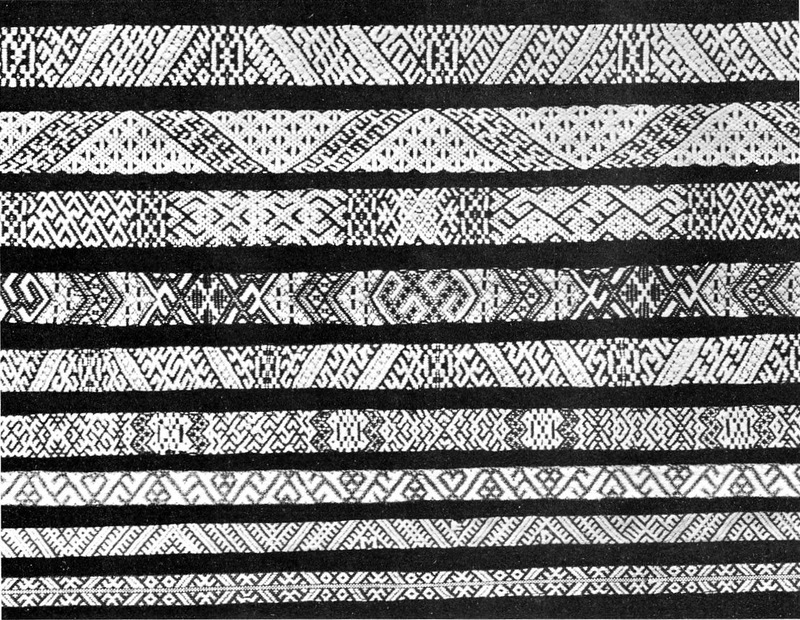 There is a great deal of individual variety in the woven black bands on these aprons. 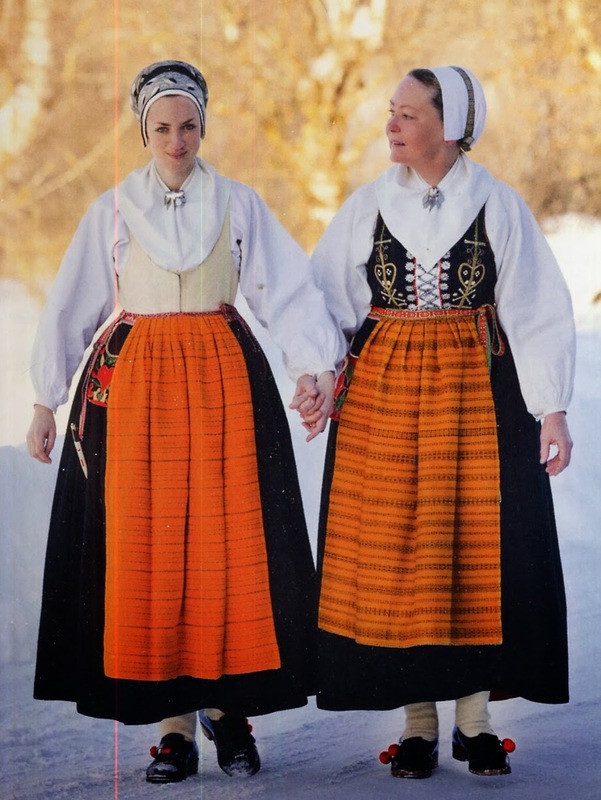 These two women are dressed up and ready for church in their personal mourning tradition. 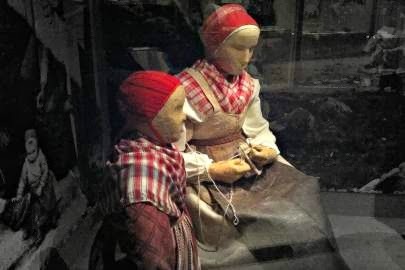 The first is from Siljansnäs, and the second from Leksand, The kerchiefs worn over the bonnet are secured differently in these two parishes, which is one of the very few differences. 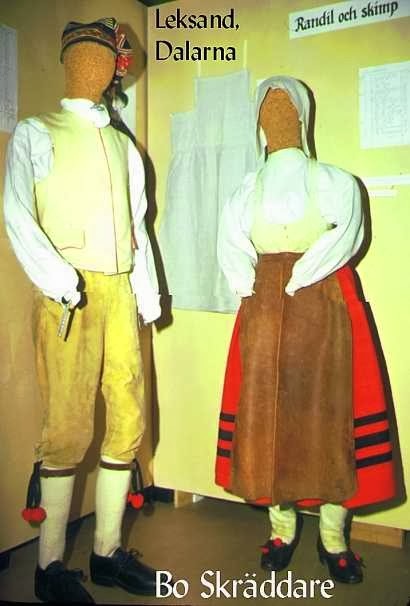 There are two additional types of apron which I wish to talk about, and these are the ones most commonly used in Folklore groups. 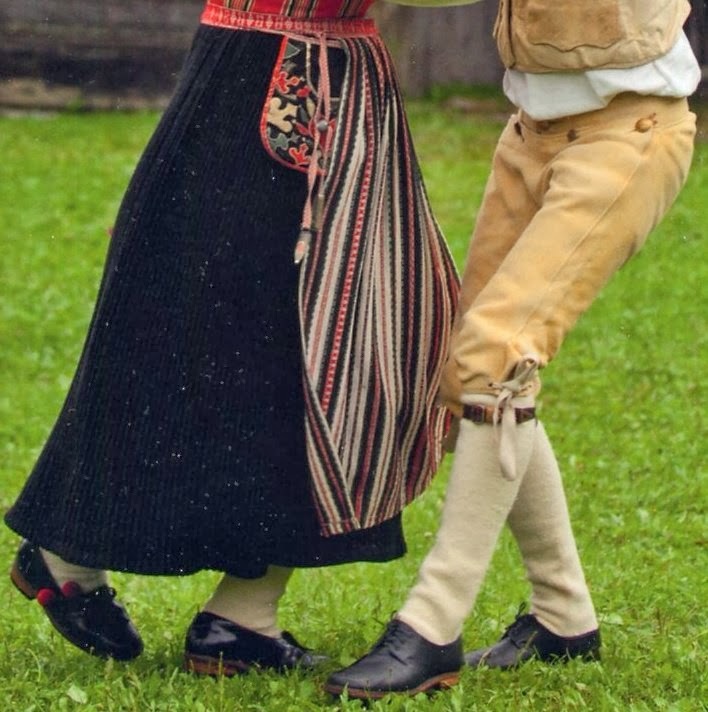 In fact, these are the only two aprons which are considered to be appropriate for dancing. 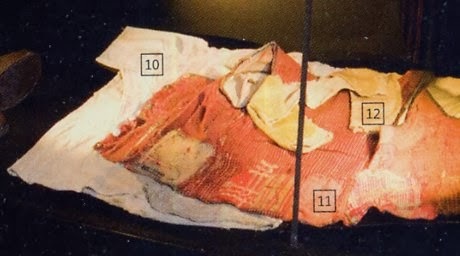 There is the apron shown at the head of the article, which is used for Sunday afternoons and festivals. 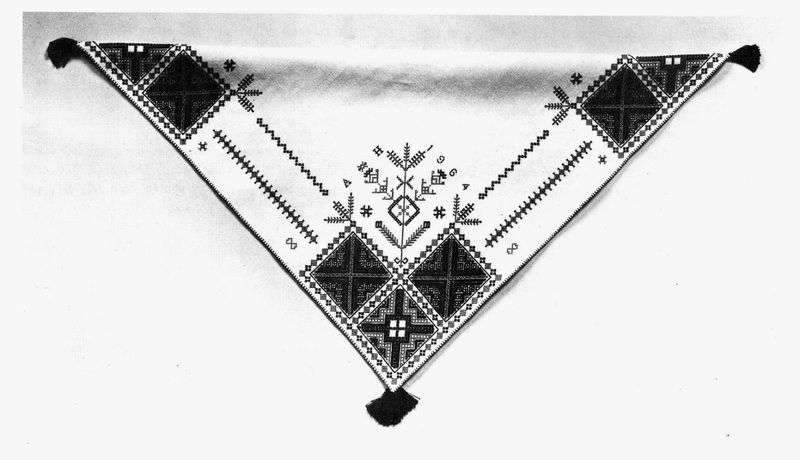 This is a 'secular' apron and is not worn in church. 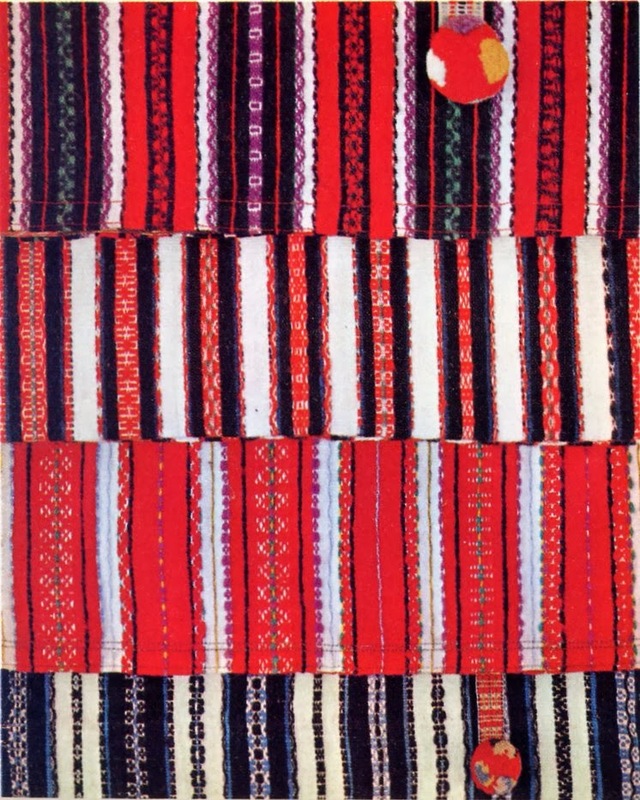 It has vertical white, black, and red stripes woven into the material, and there are many variations. 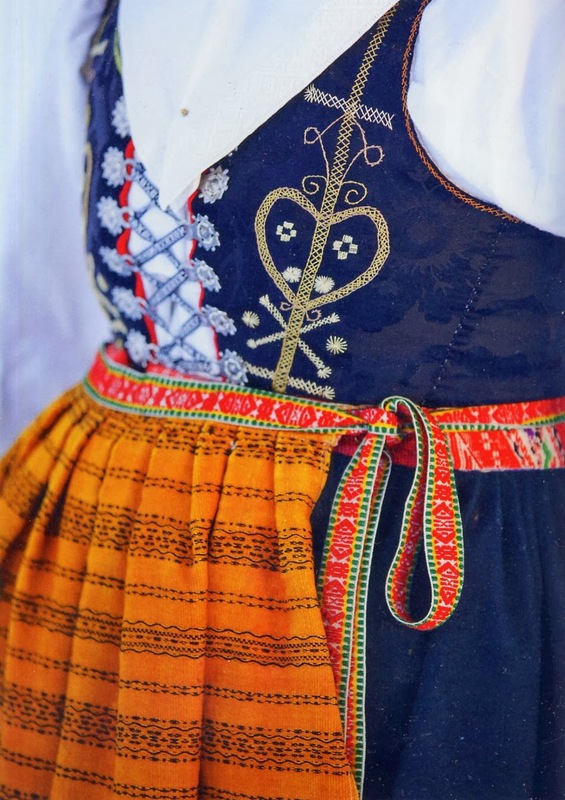 All aprons are gathered into an inkle woven band which ties around the waist and has colored pompoms attached to both ends. 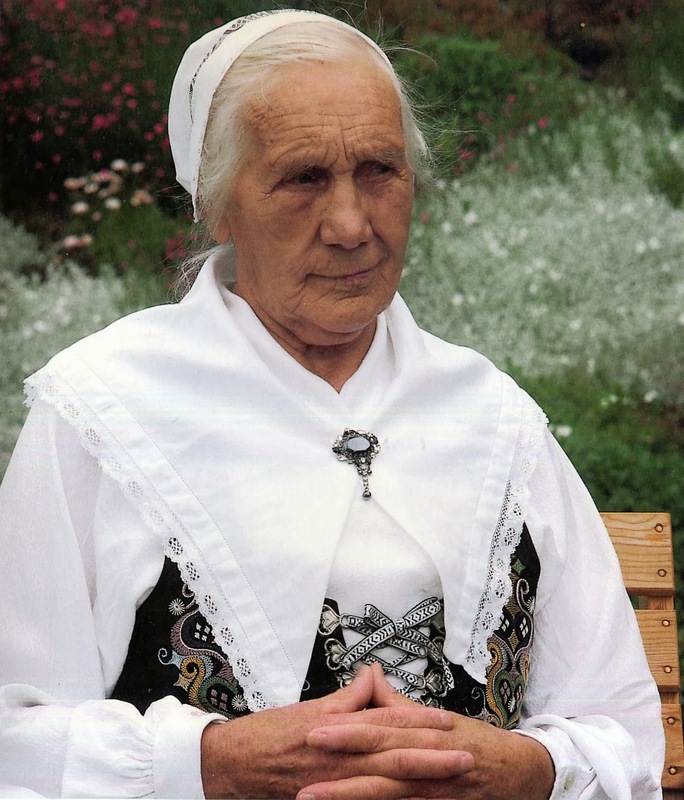 Older women tend to use more black and less red, and there is a 'half-mourning' apron which replaces the red with blue. . 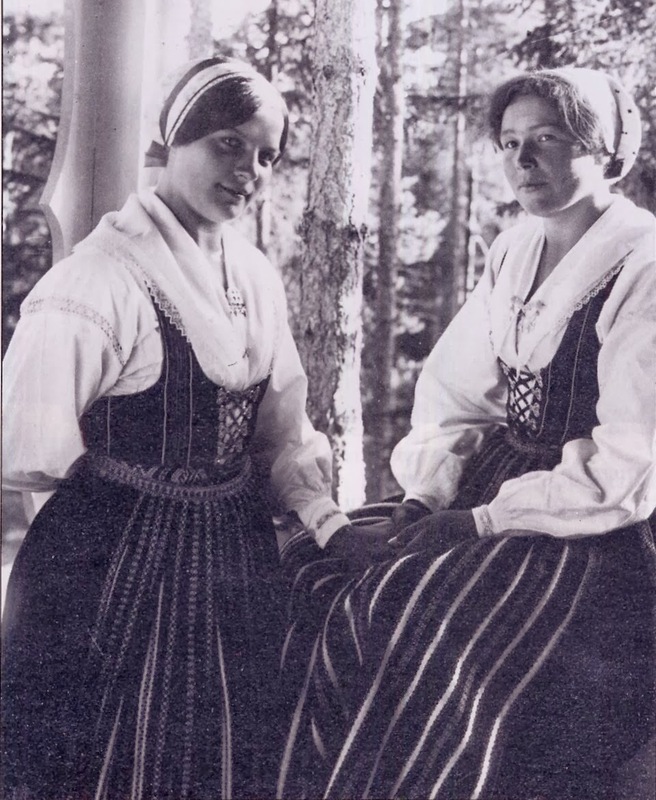 The young woman on the right above is wearing the secular mourning apron, and the woman on the left is wearing one of the glazed wool church aprons. 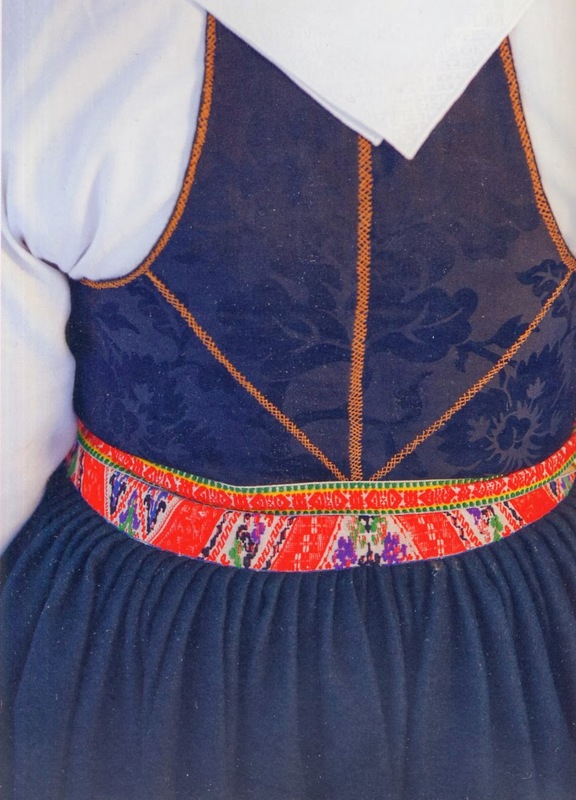 The last apron is a dark glazed blue wool with woven bands appliqued to it which is worn for weddings. This is worn for the ceremony and also for the wedding festivities. 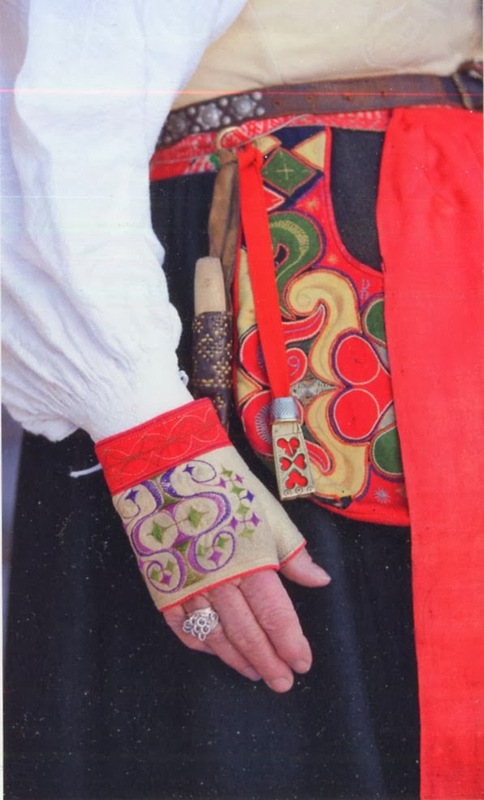 A loose pocket, kjolsäck, is worn which is ornamented with applique, and often the same kind of embroidery as is used on the red damask bodice. 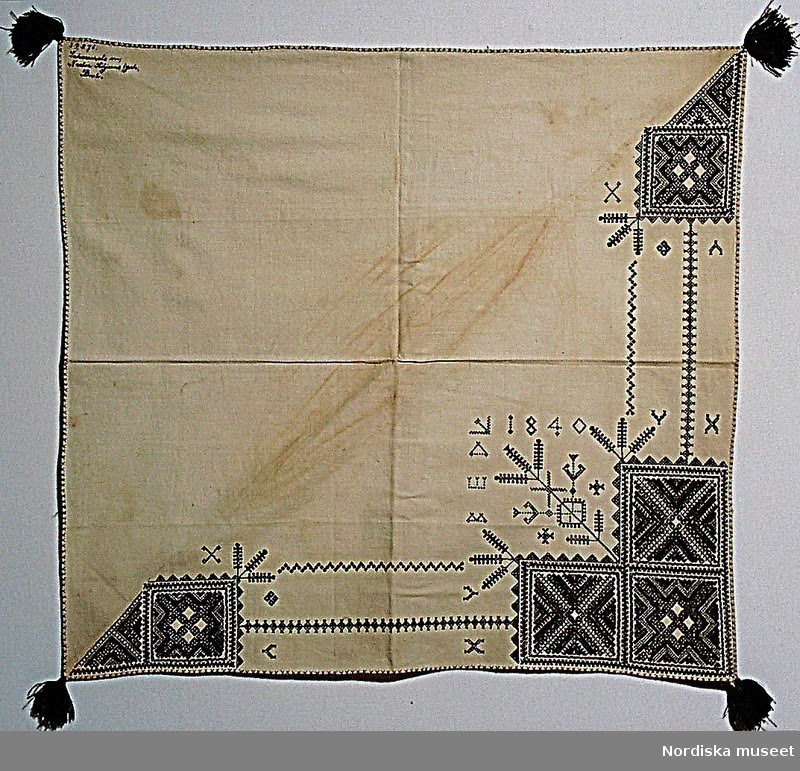 The same sort of curvilinear motifs are used on the pocket. Over the skirt and apron, a leather belt with metal ornaments is worn. 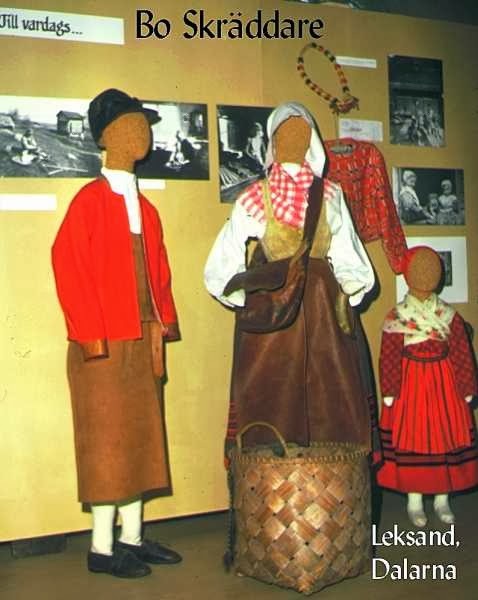 The first, third and fourth belt in this image are from Leksand, the second from Dalby. 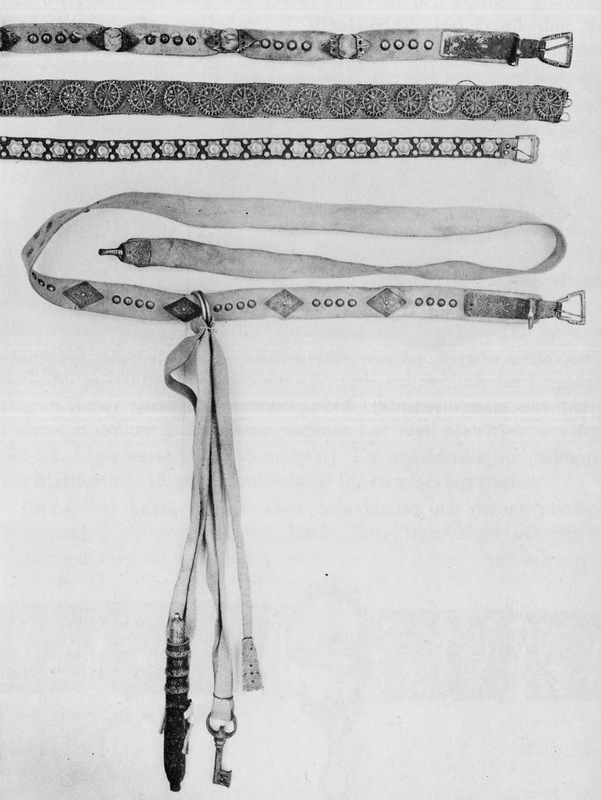 Various useful items were often hung from the belt. 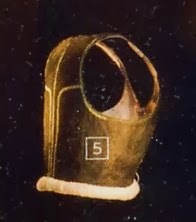 Bonnet shaped caps, hatten, are worn with this costume. 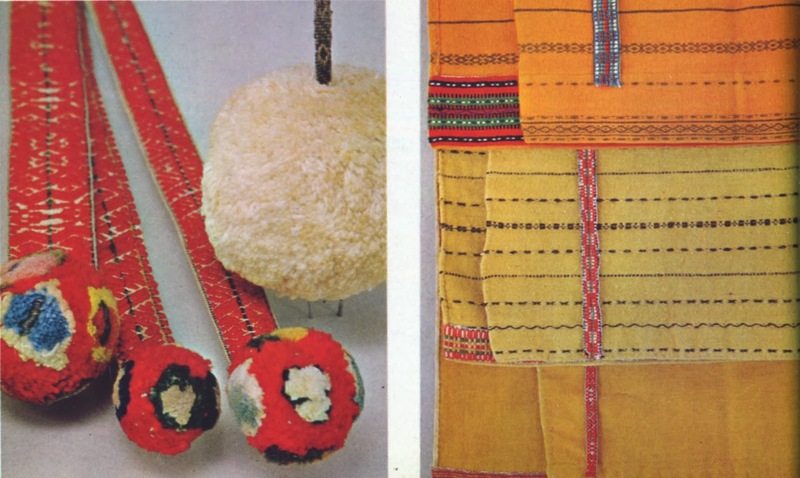 Single women make them out of colored or printed cloth, see the images in this article. They conisist of two pieces, a rectangle which covers the top and side of the head, and a round piece gathered onto the back. 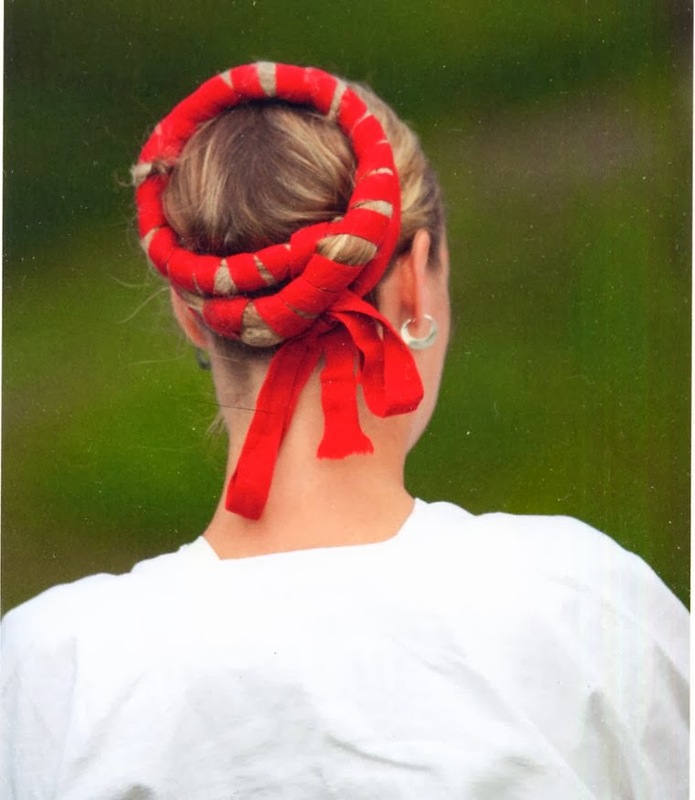 The back fits over the braids pinned to the back of the head, and is secured with a ribbon tied just in front of them. 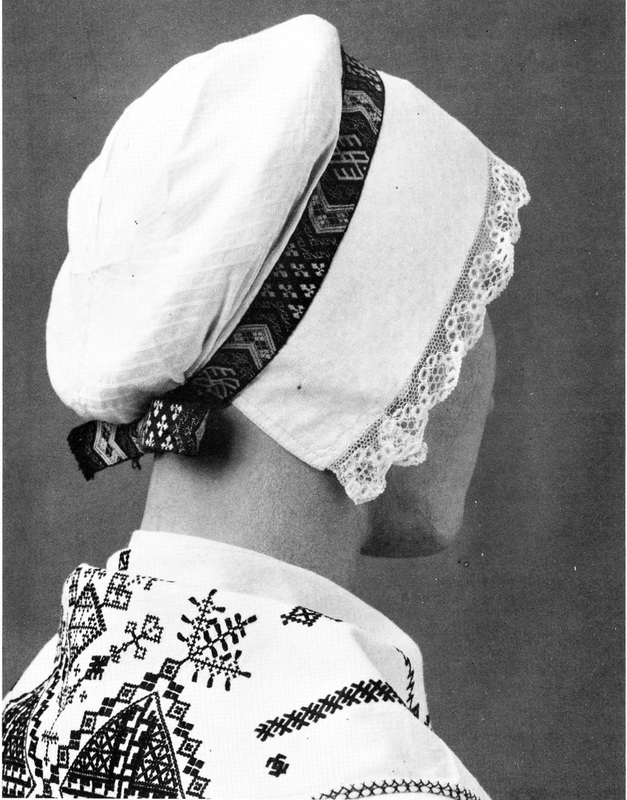 Married women wear a hatte of white linen with a bobbin lace edging in front, and secure it with a 'sootbande', inkle woven with designs in black and white. 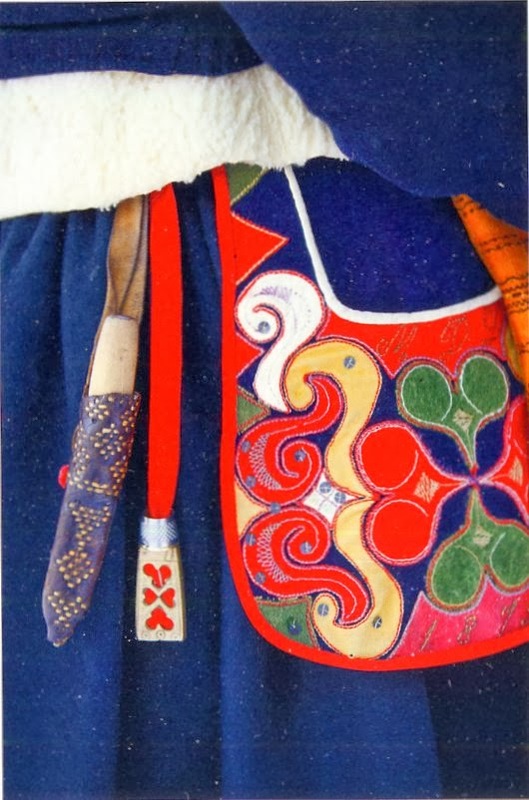 Here is a closeup of a cap, some bands, and some Leksand bobbin lace. 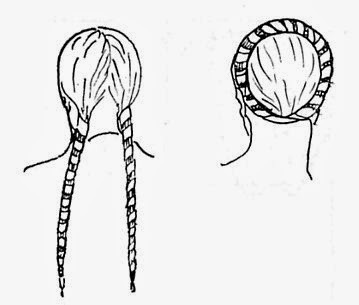 In winter, leather or sheepskin caps may be worn over these. White wool stockings are worn, tied with garters above the calf. Black shoes with a tongue that falls over the front are used, decorated with red pompoms on special occasions. 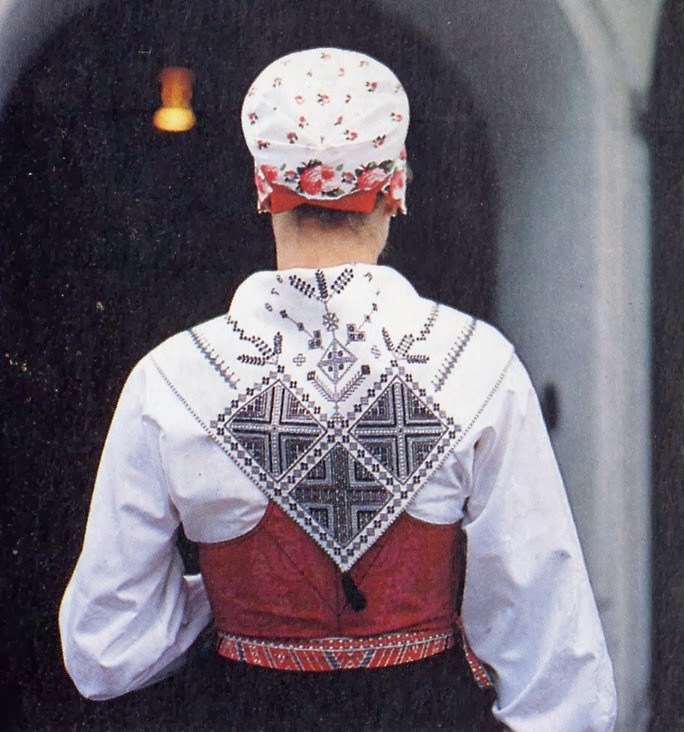 The last clothing item I will talk about today is the shoulder kerchief, the halskläde. For every day and informal occasions, it is of a home woven plaid, or a commercial scarf. Peruse the various images. 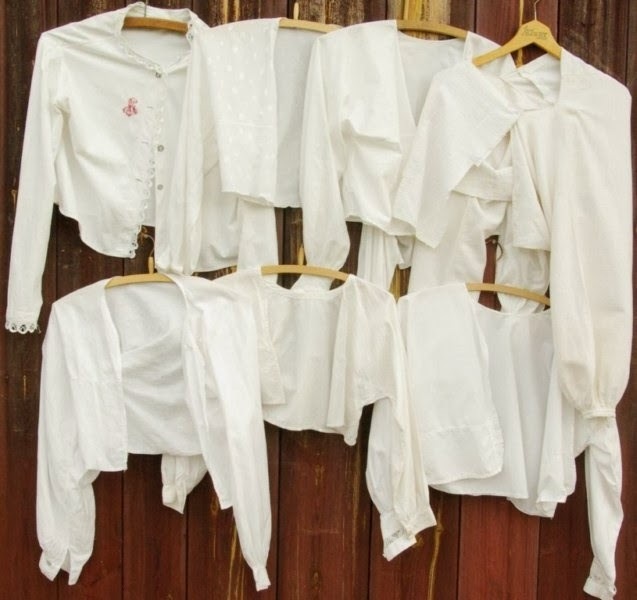 For Sundays, it is white linen, sometimes edged with bobbin lace. It is secured with a ring brooch, simple ones for everyday. 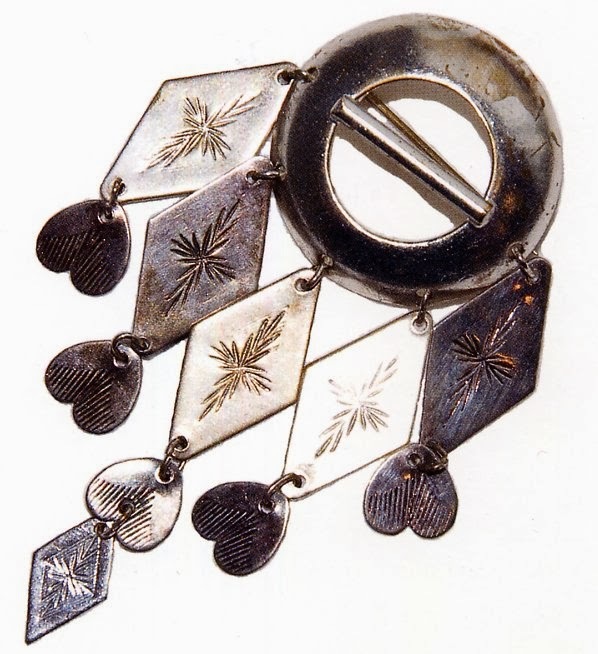 For special occasions the brooch is decorated with silver dangles. 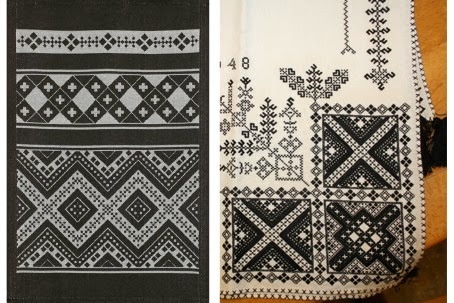 The wedding guest halskläde is ornamented with a very particular type of embroidery in black silk, called svartstick. 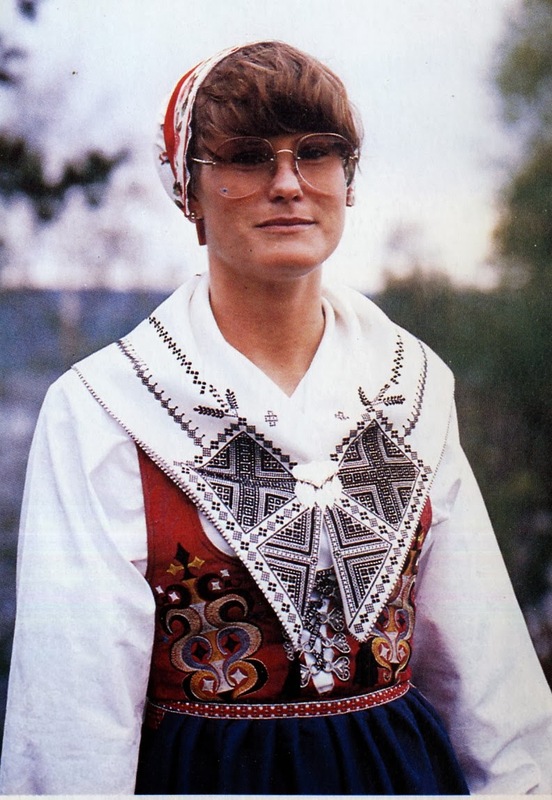 This style is particular to Leksand. 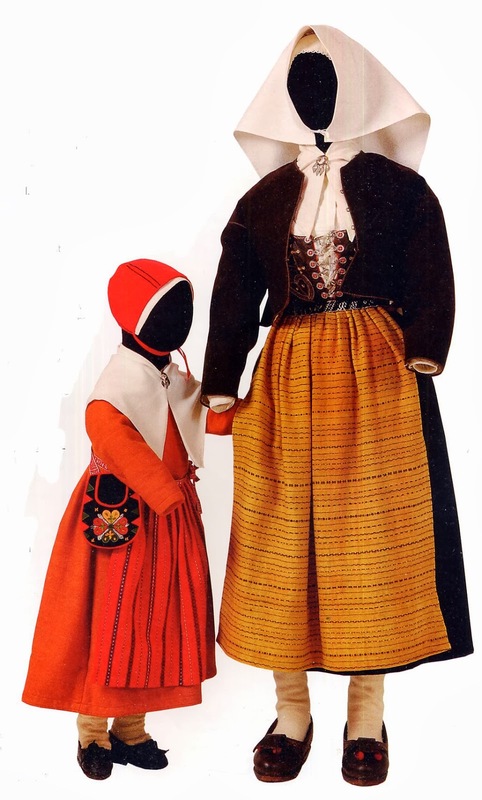 Gagnef and Ål [Åhl, Åls] parishes also have black embroidery on this garment, but each has a different style. 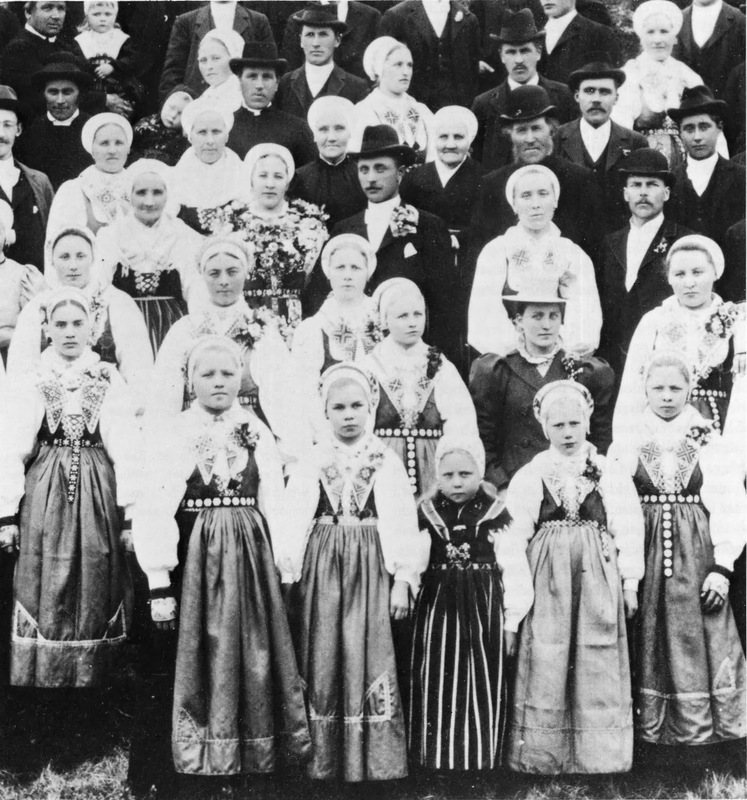 Here is an old photo of a wedding in Leksand. The bride and groom are in the center, the bride with a garland of flowers around her shoulders and the groom with a large bouteniere. The attending women are all wearing the embroidered shoulder shawl, and, you will notice, the blue apron with appliqued bands. 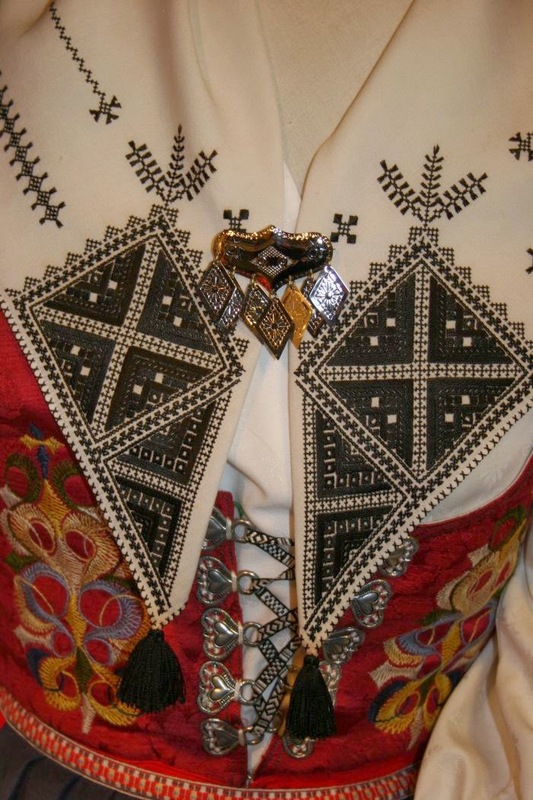 Here is a good closeup of the embroidery on the wedding guest costume, both bodice and shoulder shawl, front and back. She is wearing a single woman's cap of calico. 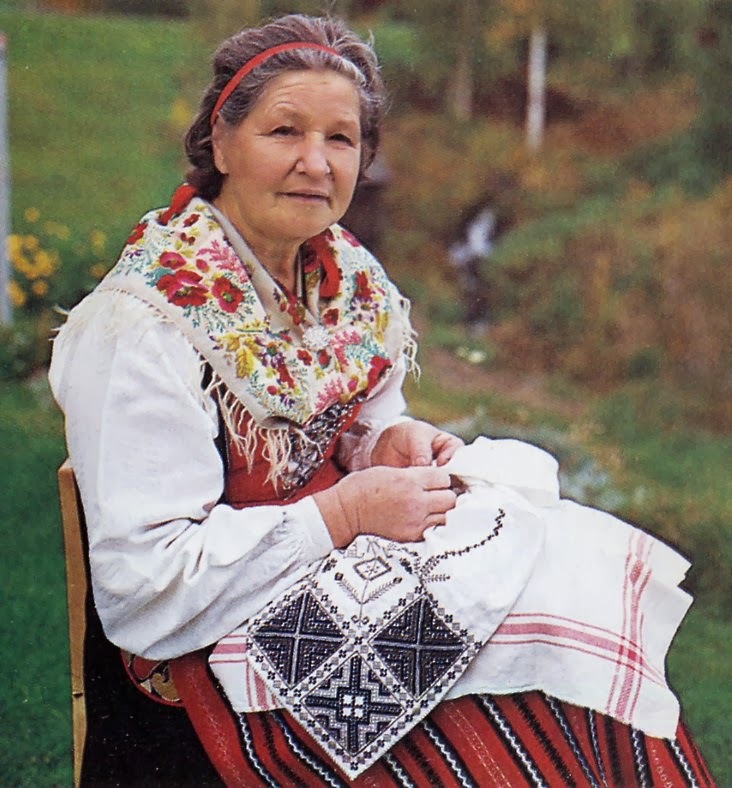 Here is a woman in Sunday afternoon dress embroidering, or more likely just posing with, the embroidered halskläde. 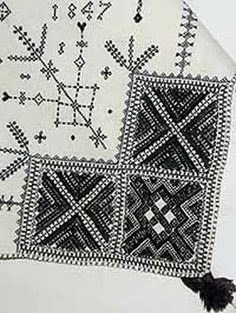 The motifs used somewhat resemble the white embroidery used on the shirt. 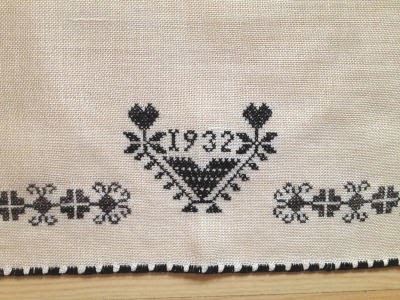 The stitches used are cross stitch, holbein stitch, and counted satin stitch. 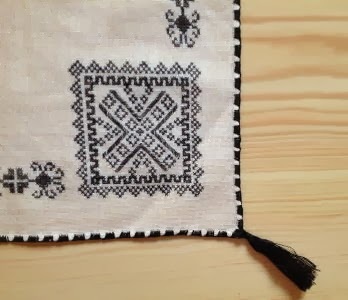 There are always three squares in each corner of two different designs, stitching which connects them, and usually the initials of the embroiderer and the year of execution. Within this broad framework there is a variety of detail. 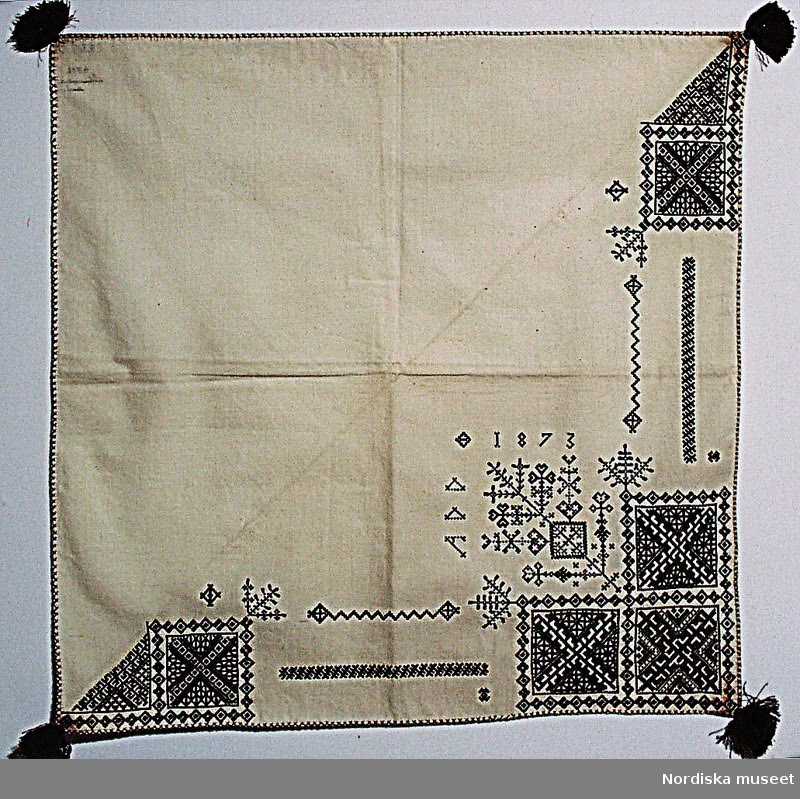 Black tassels of the embroidery silk are attached to each corner. Here are a number of examples. You can see that each is different. 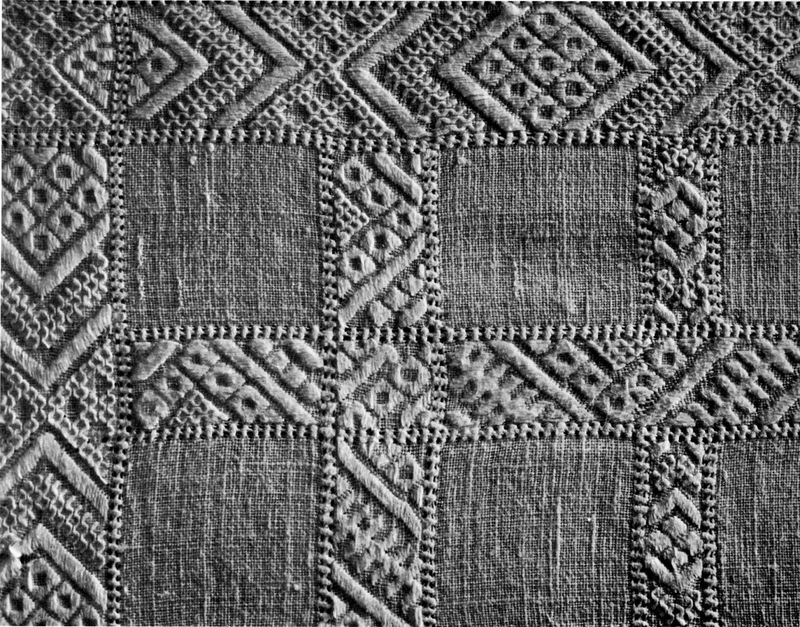 Sometimes all four corners are embroidered, but more commonly, as the halskläde is worn folded in two, only half of it is embroidered. 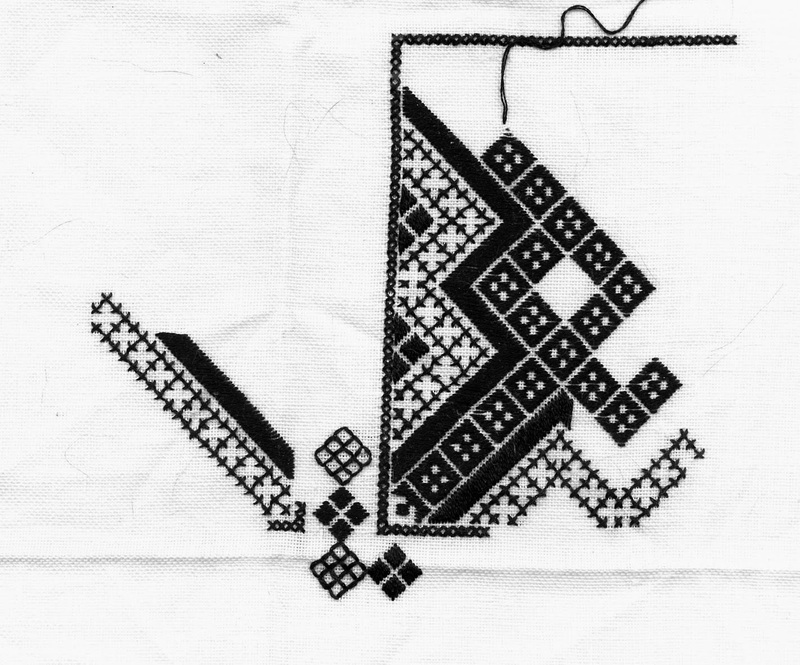 Here is an unfinished project of mine in this type of embroidery. Here is a contemporary dresser scarf done in this style. I think that I have gone on long enough. I will save the mens costume for another article. Thank you for reading. I hope that you have found this interesting and informative. 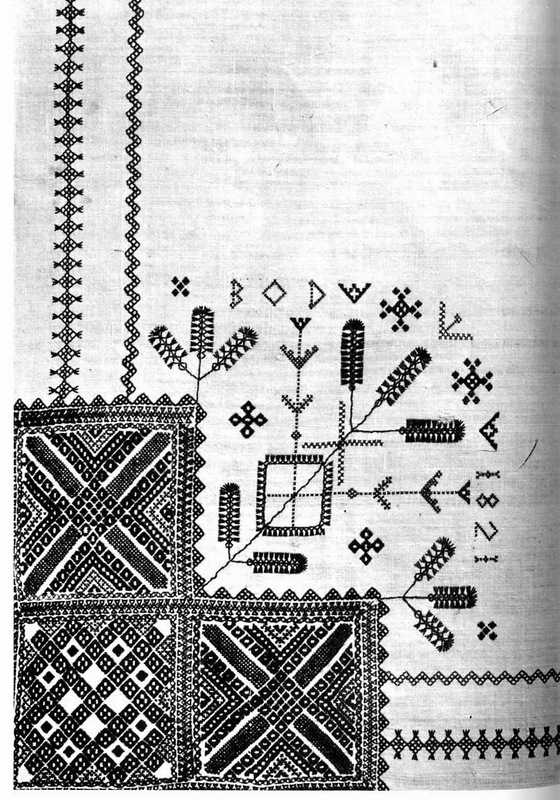 And perhaps you will adapt some of this embroidery to a project for yourself or others. 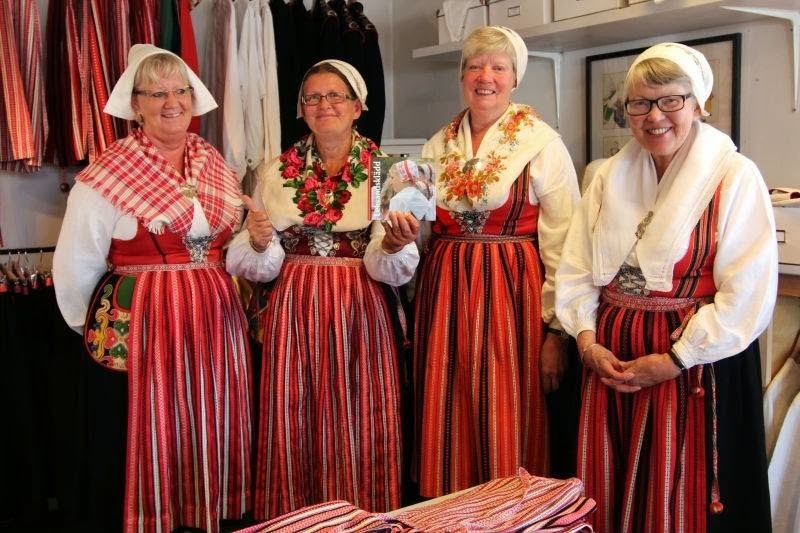 Bring a bit of living Swedish culture into your home. I will close with just a few more images of this costume. 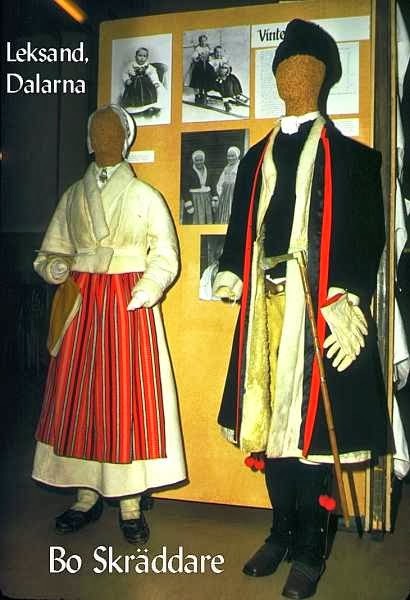 Here you see modern blouses of the era with the rest of the costume traditional, caps, aprons, skirts, pockets, etc. 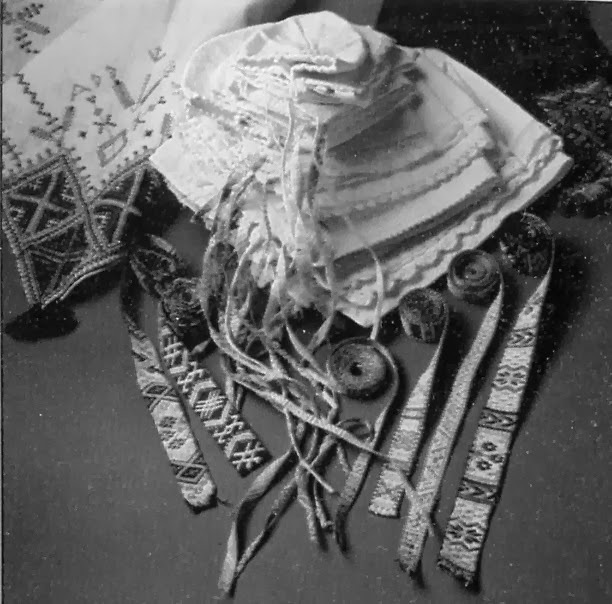 A pile of marred woman's caps and the bands to tie them. Thank you so much for this awesome post! thank you for this post. love the inspiration for winter attire! Fabulous and comprehensive article. As an American with ties to Dalarna (the village of Nås, about an hour from Leksand) I found it particularly informative. 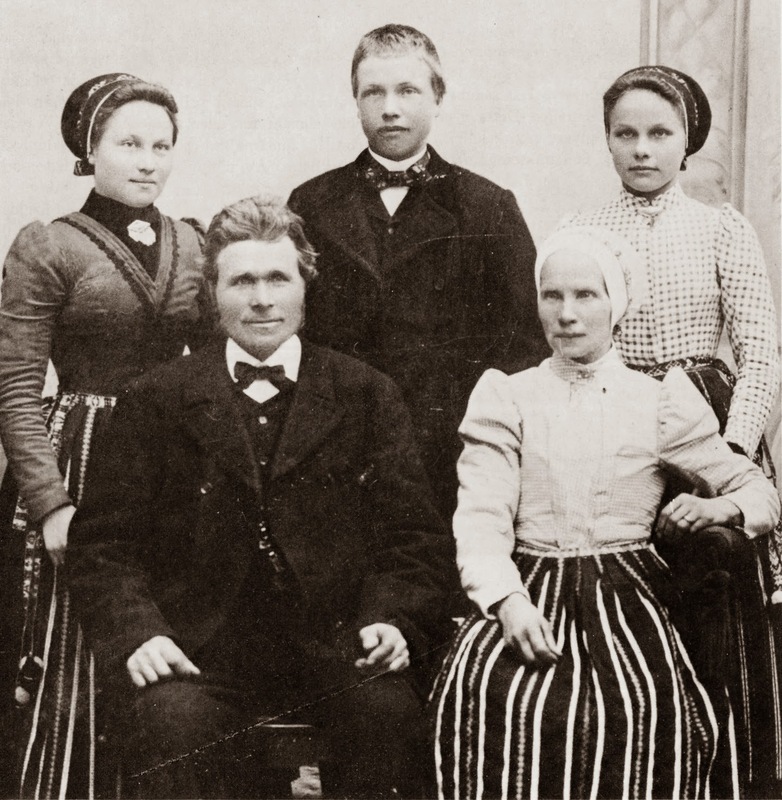 I was excited to find my great-grandmother and her mother in the black and white photograph of the wedding in Leksand! 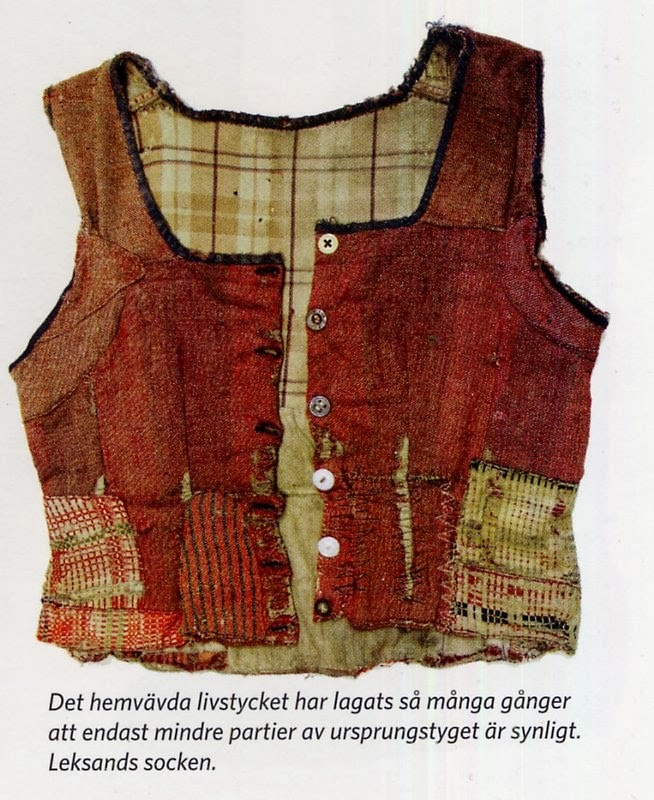 A wonderful detailed and so well documented article about Leksand costume. 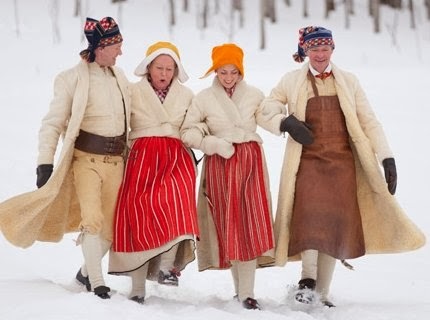 I used to live near Rattvik and loved finding out about the traditions. I have Mora costume of my own which I got 2nd hand. 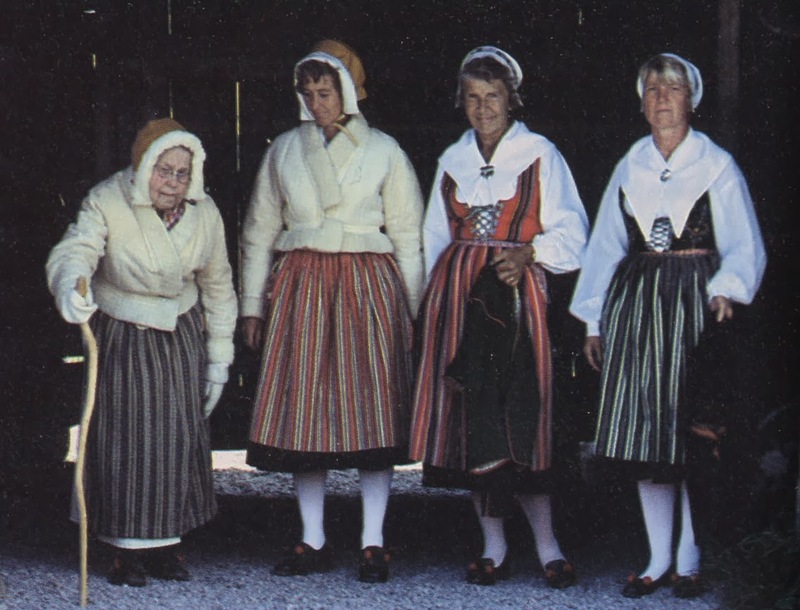 I inherited my grandmother's full costume from Leksand, and remember her meticulous instructions in how to wear it. 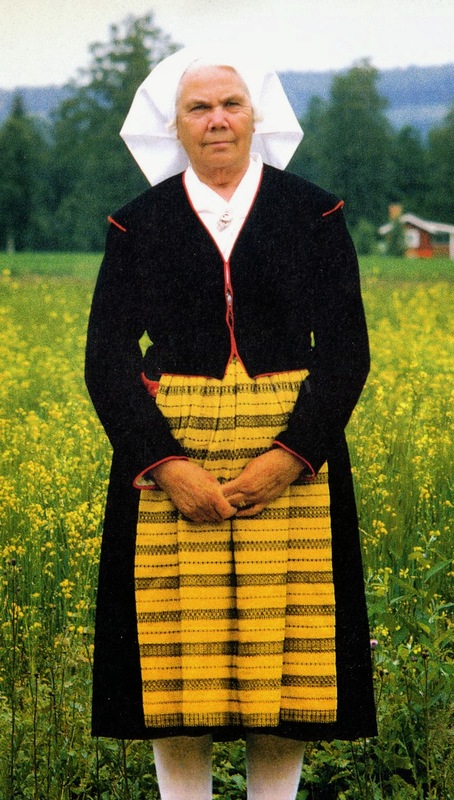 We also had the little yellow dresses and flowered caps when we were little, all of which she brought with her to Canada from Sweden. Thank you for the wonderful reminder!